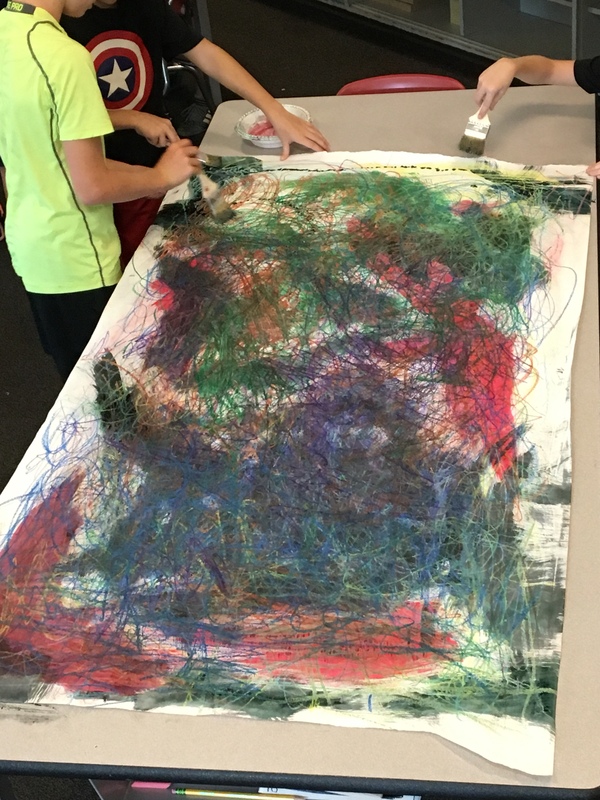 We are in the beginning stages of a challenging art project. 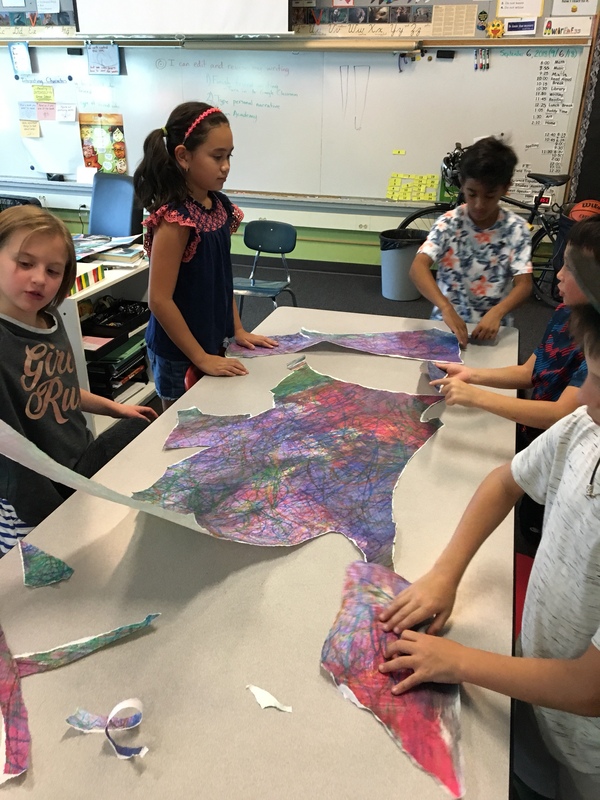 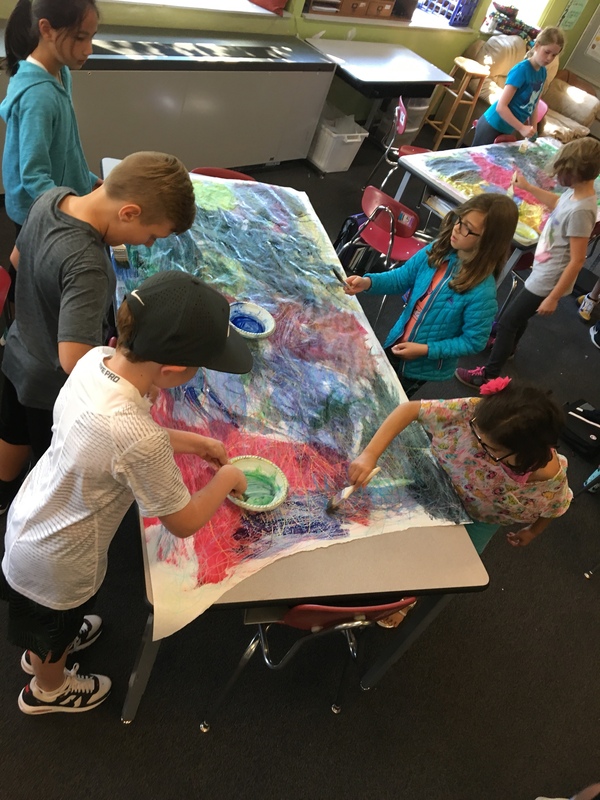 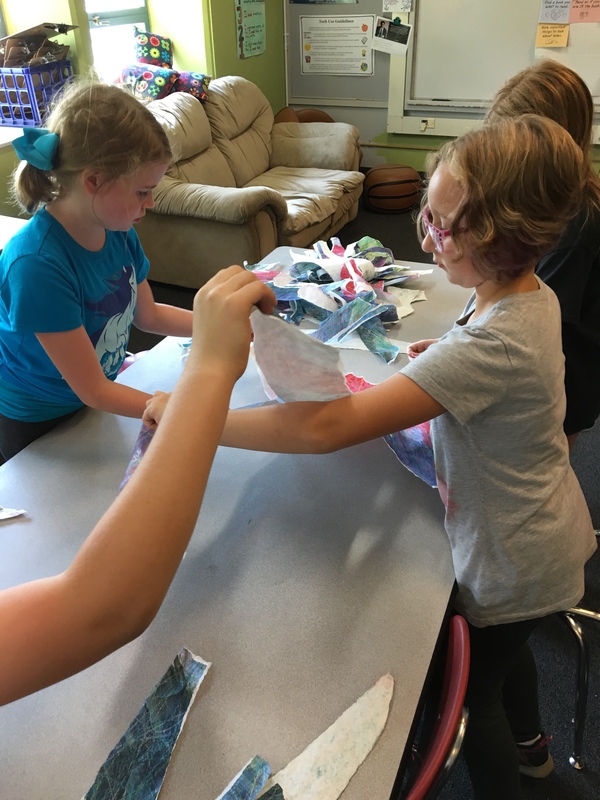 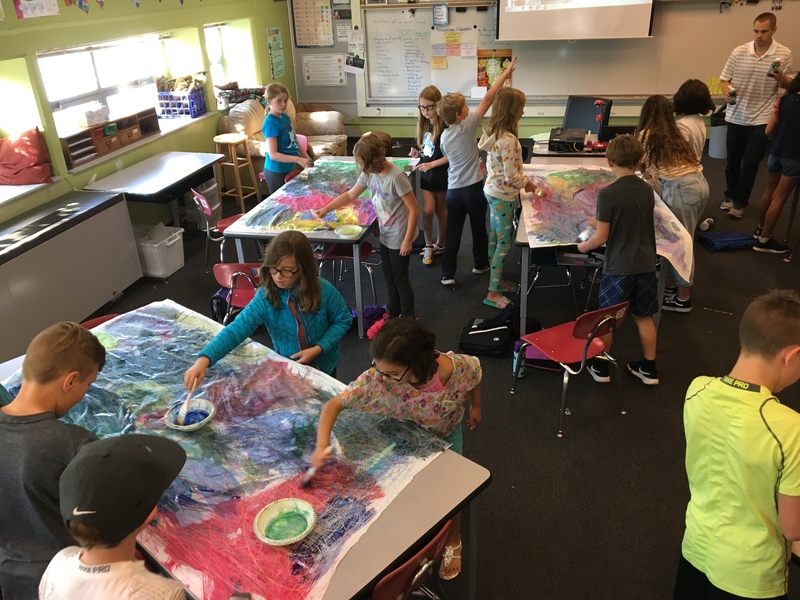 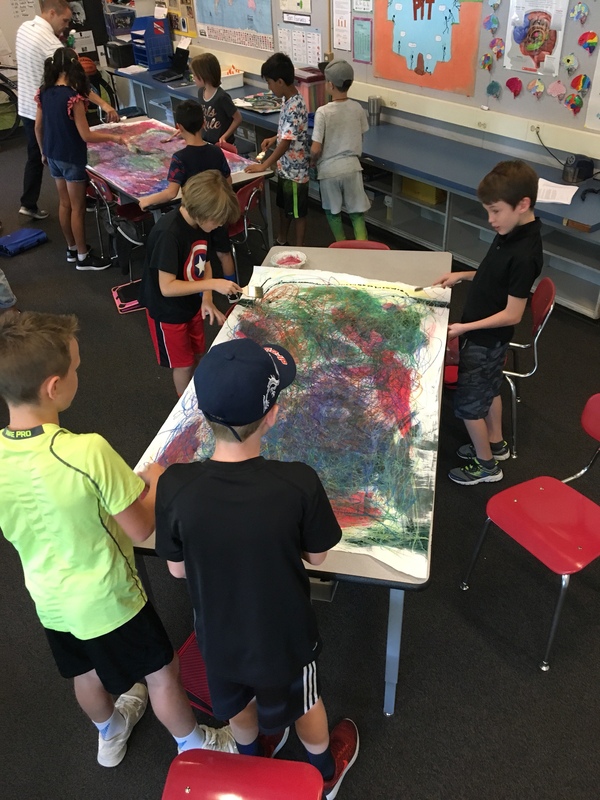 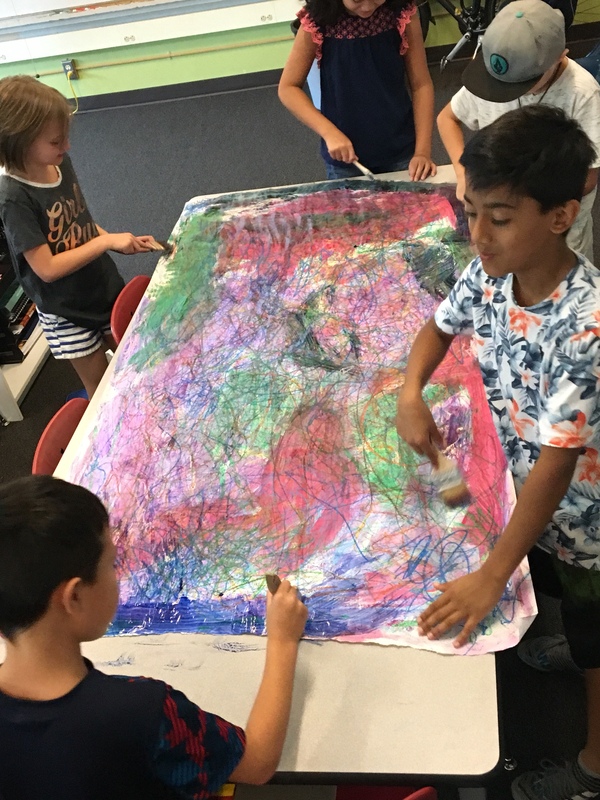 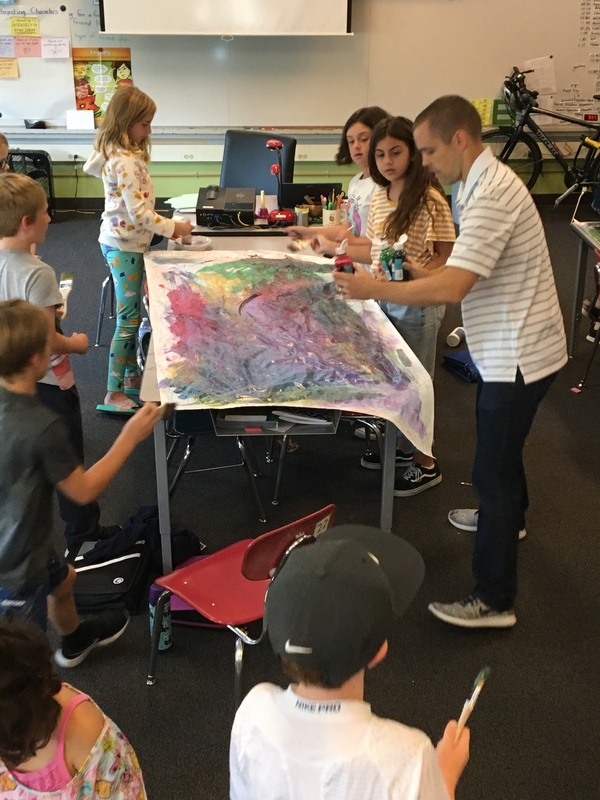 Students had a great time creating colorful paper to be used as part of a collage. 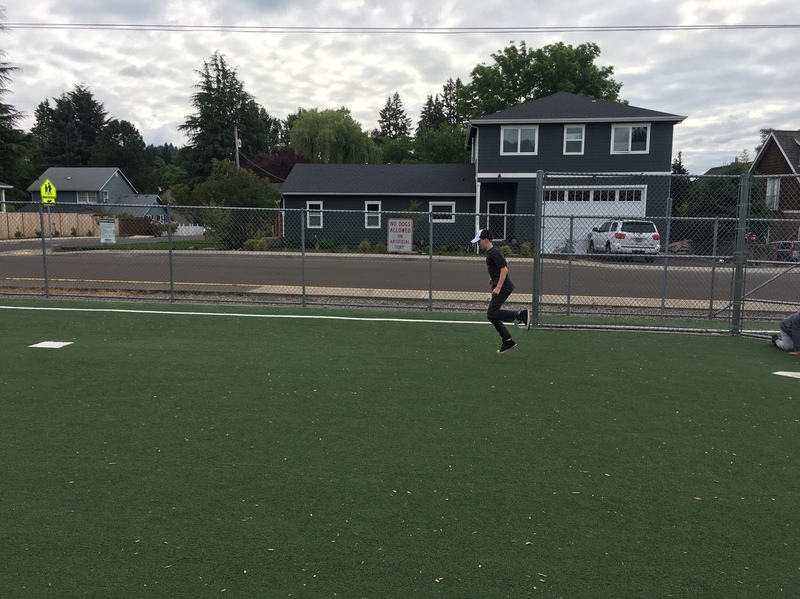 Stay tuned for updates in the coming weeks. 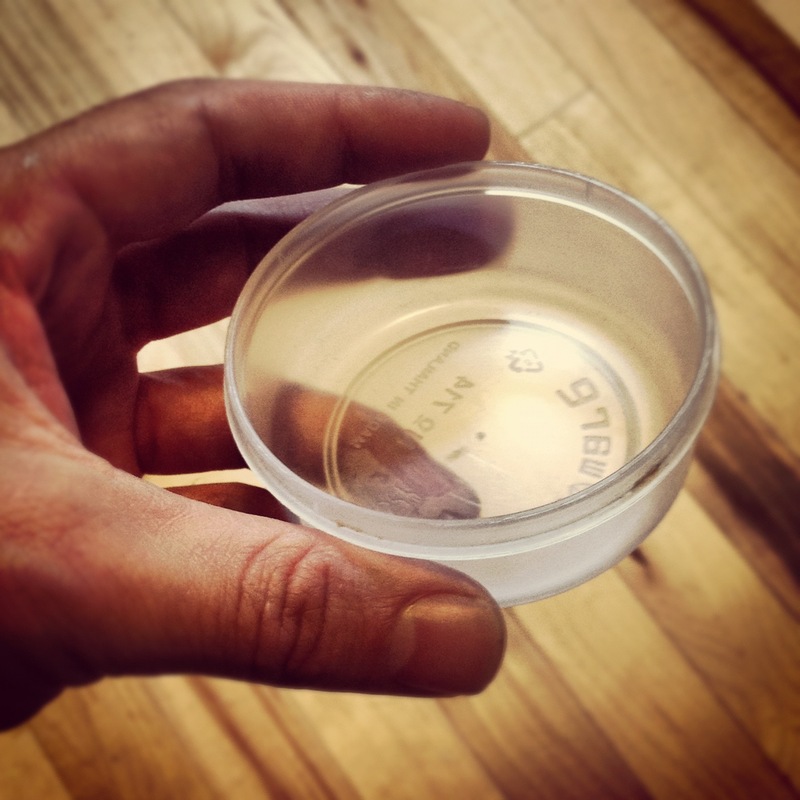 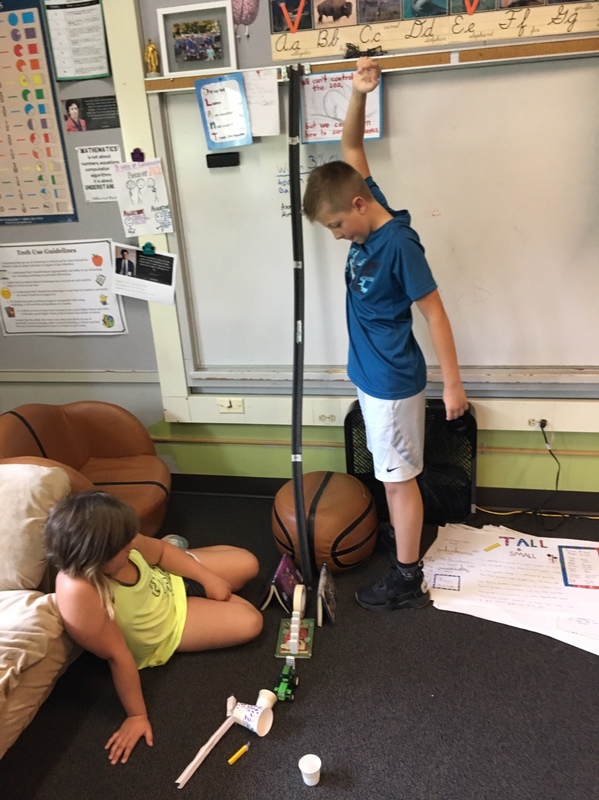 Don’t be surprised if your child’s bedroom turns into a chain reaction science lab this summer. 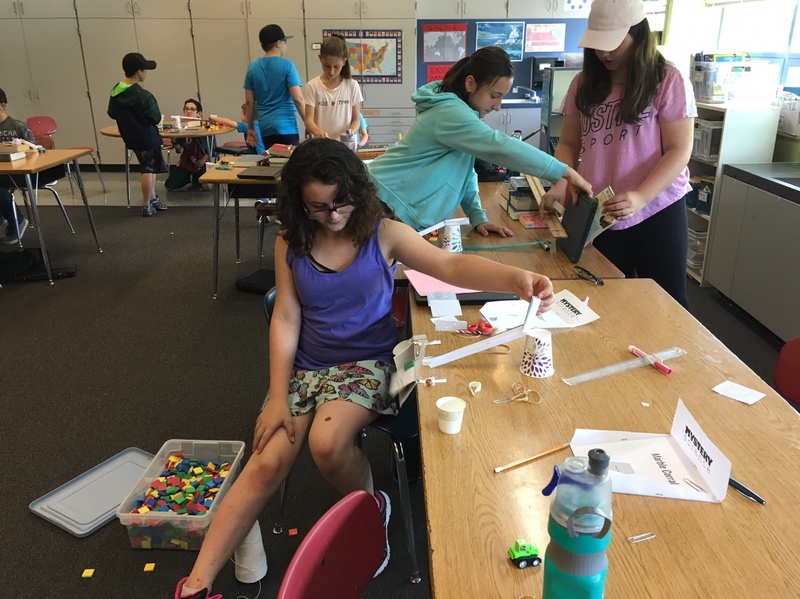 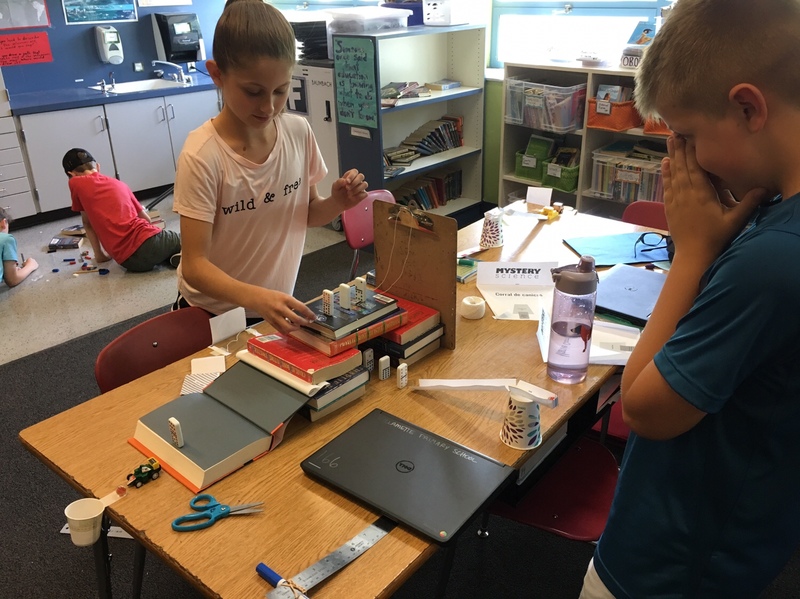 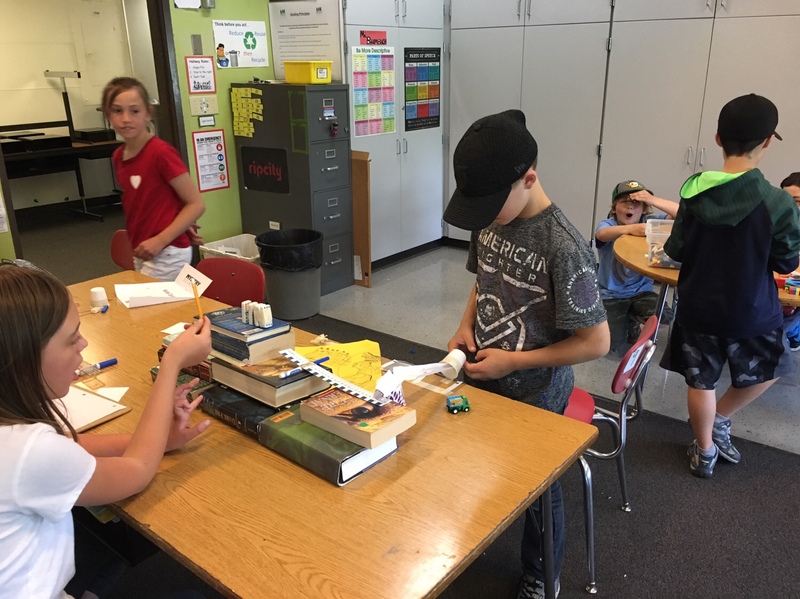 After learning about Rube Goldberg and how energy is stored and transferred, we set off on making our very own chain reaction machines. 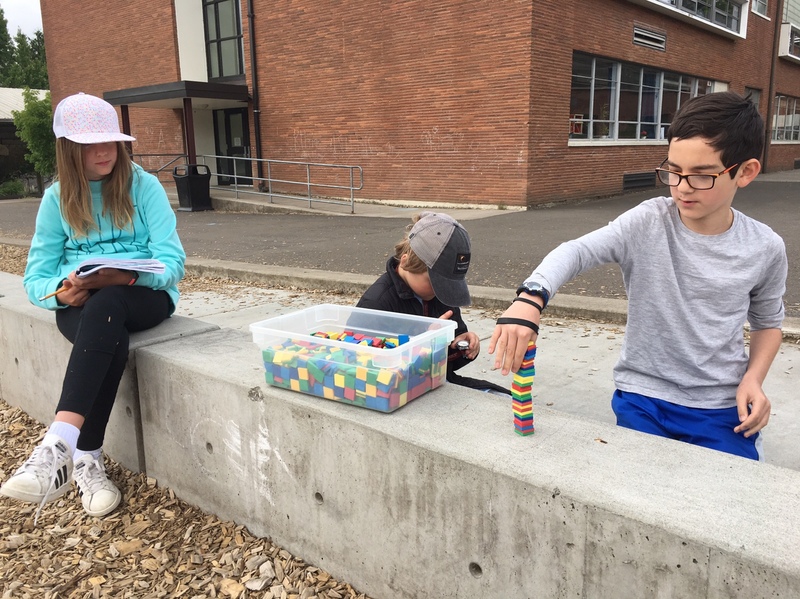 After doing some basic two-step chain reactions, students were set free to experiment and create the most elaborate multi-step chain reactions they could. 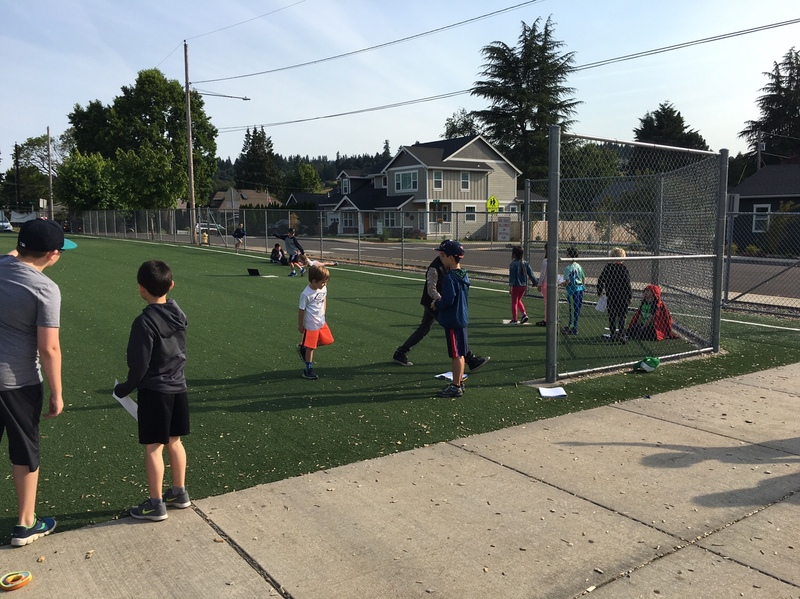 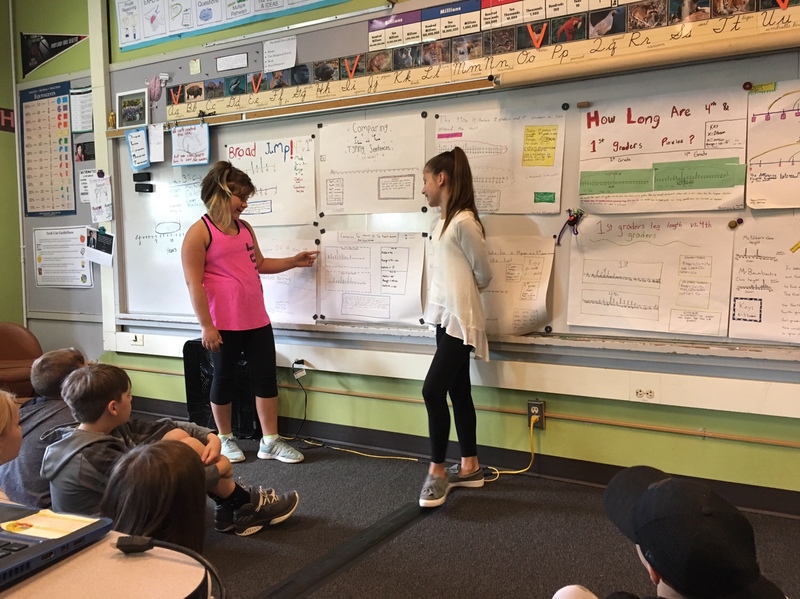 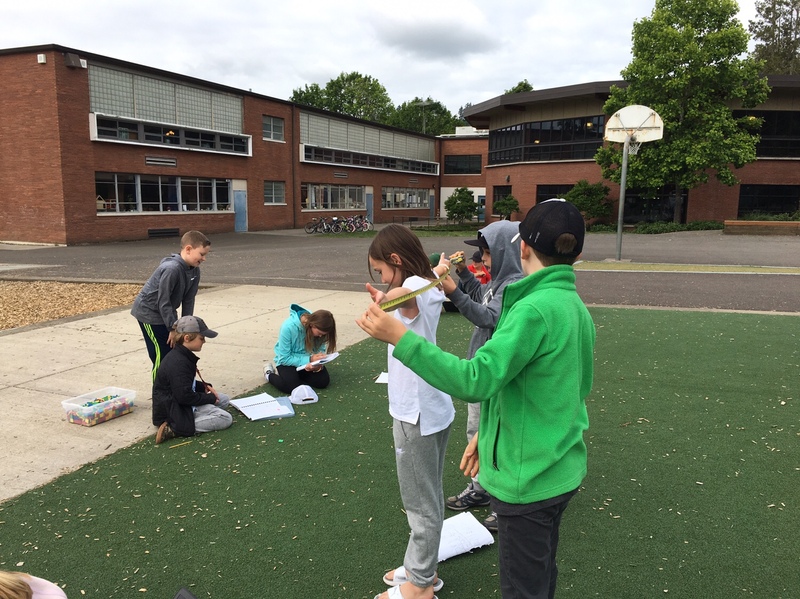 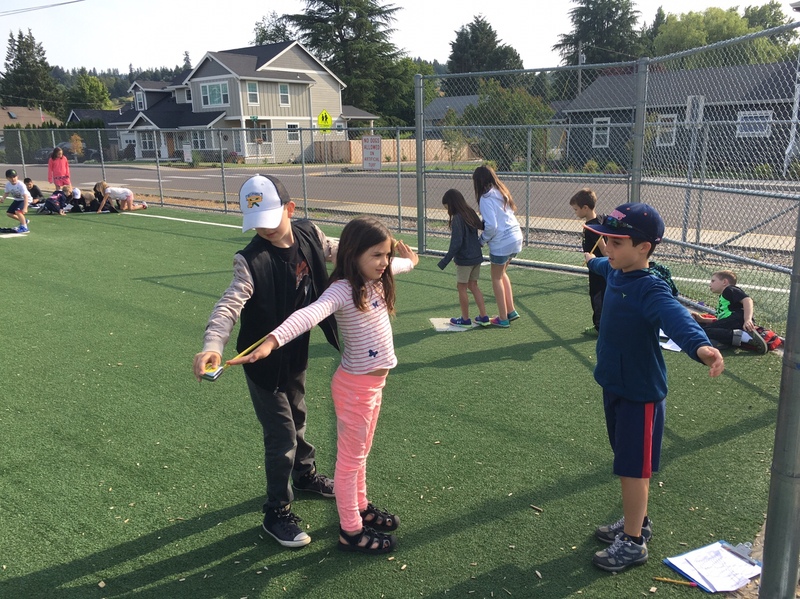 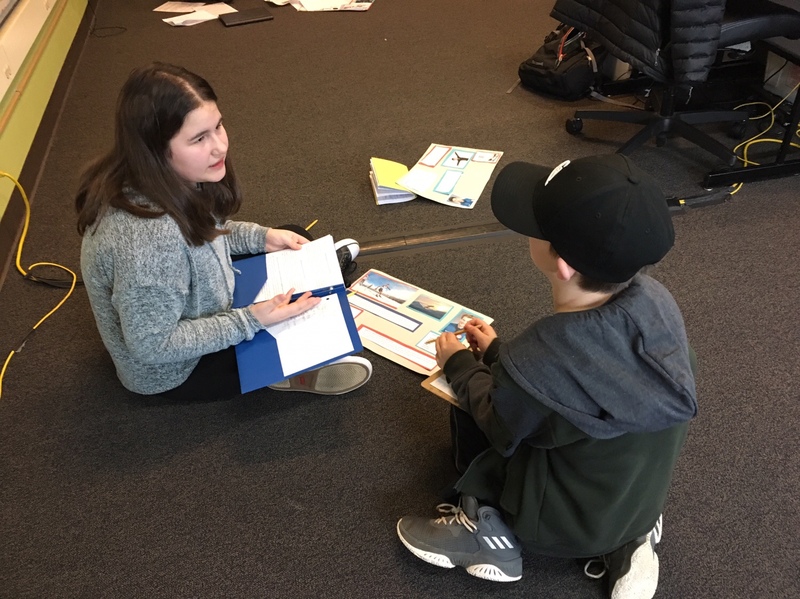 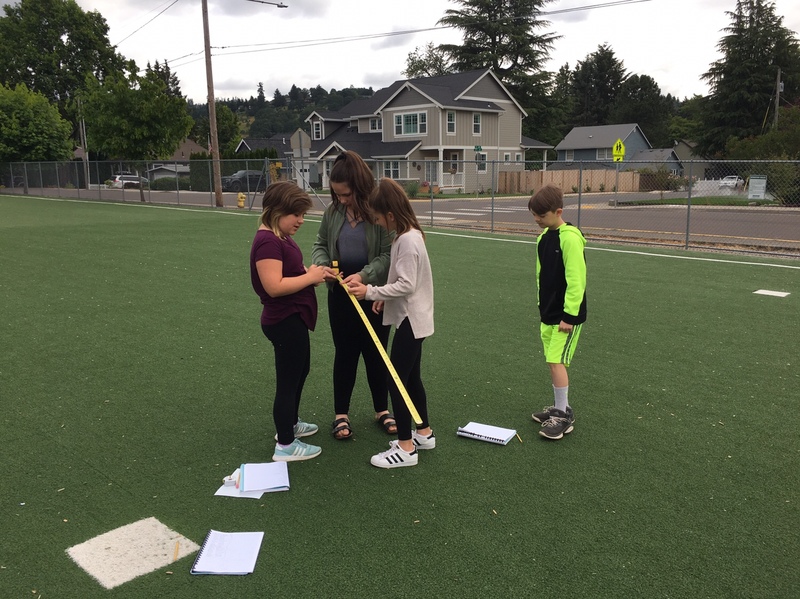 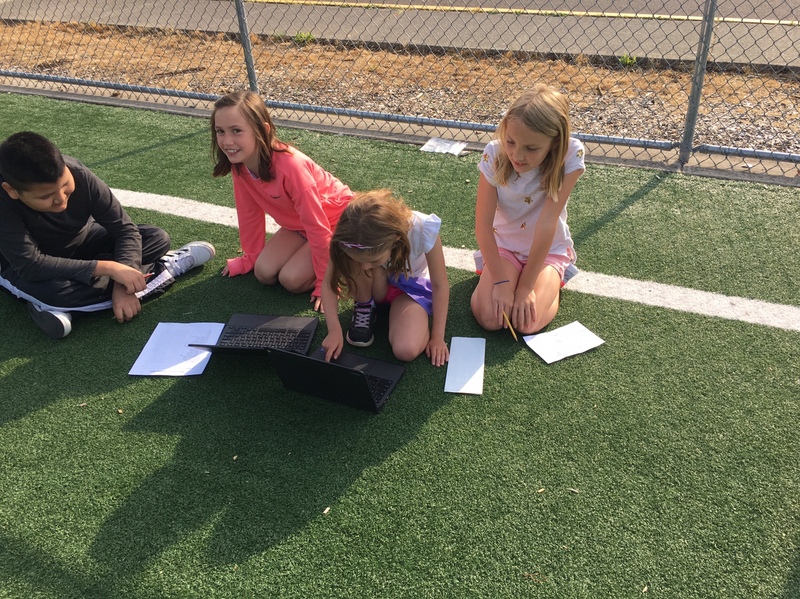 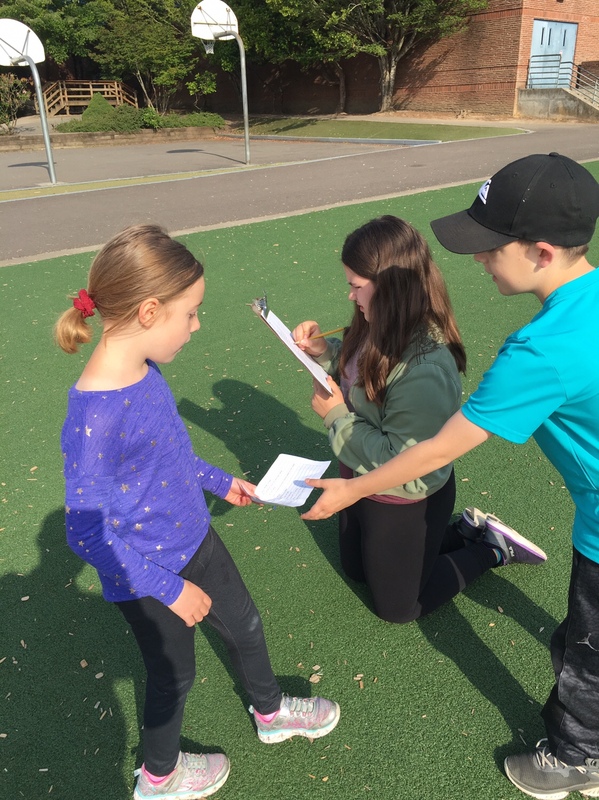 Fourth graders spent time in recent days trying to answer questions like how long does it take to hop on one foot from home plate to first base? 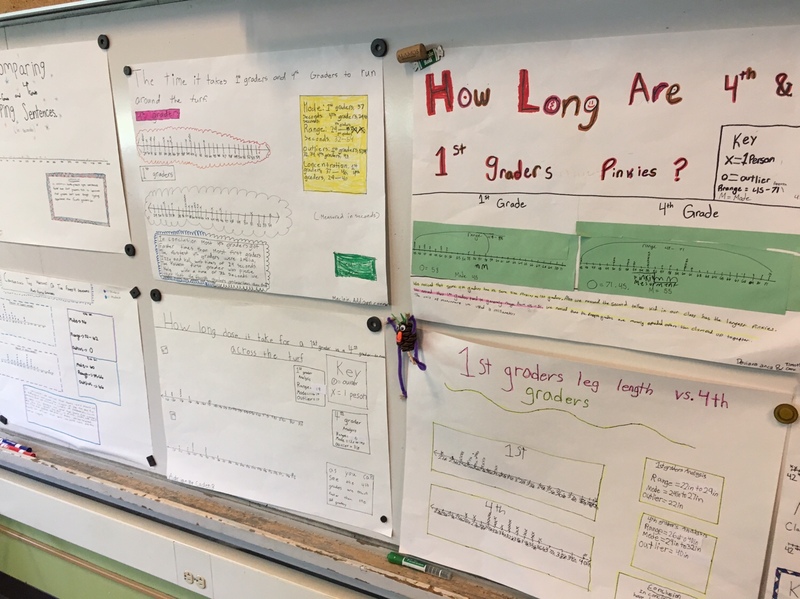 Or how long does it take to type a sentence? 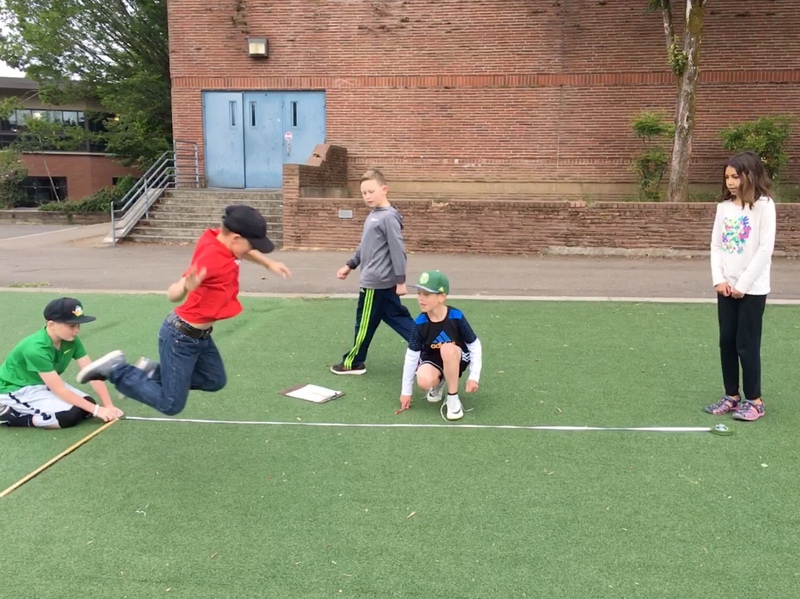 Or how far can you broad jump? 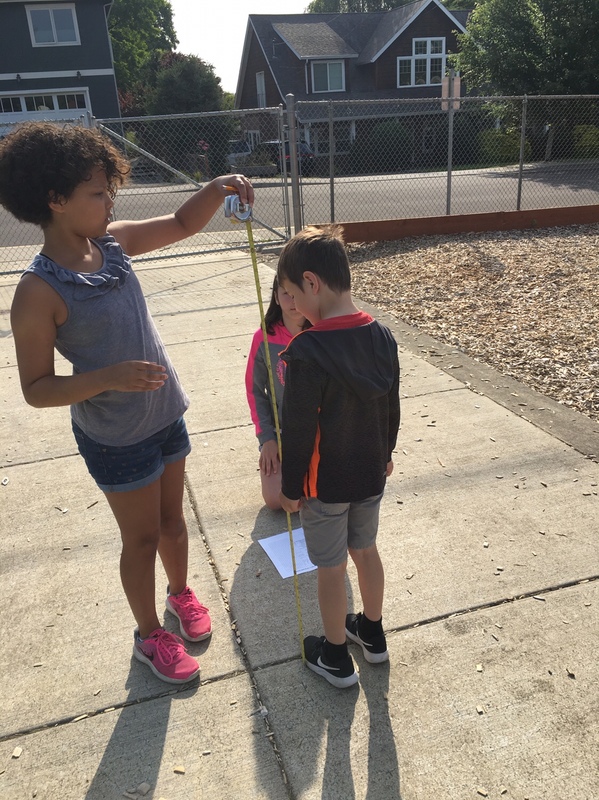 After students came up with these questions they determined the tools they would need to collect this information and figured out what units of measurement would make the most sense. 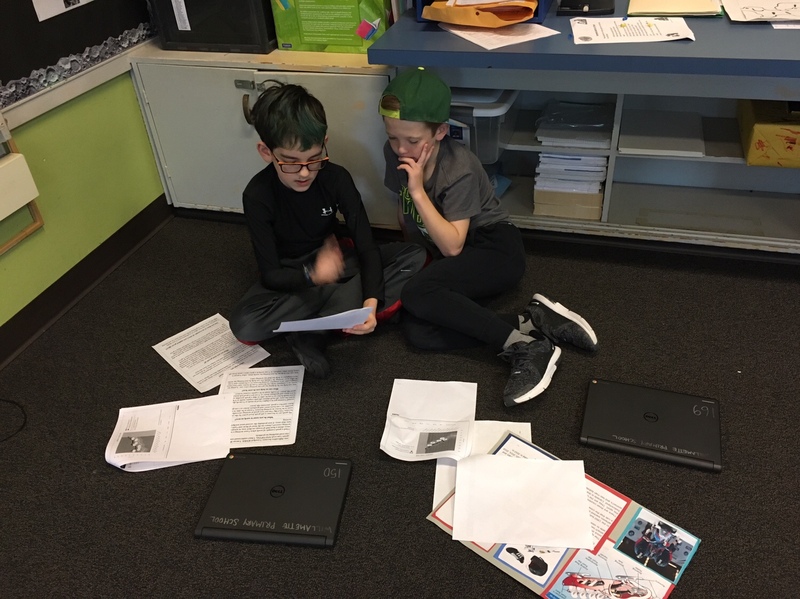 Then they went out and collected the information from one another. 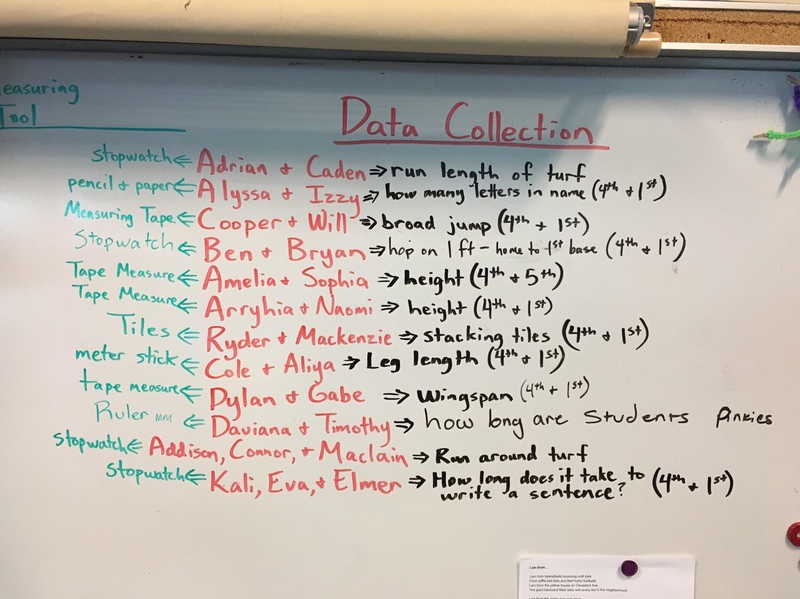 Please ask your child about their analysis of the data collection and what they learned from this experience. 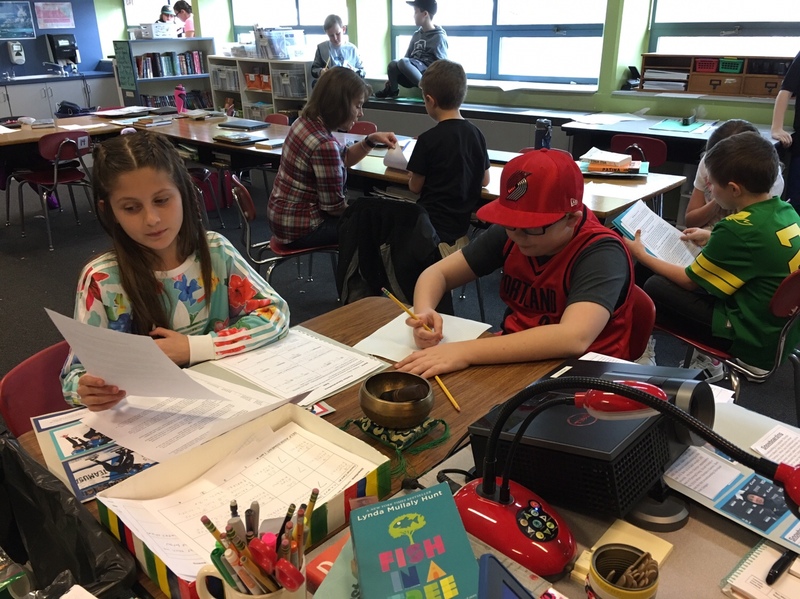 As we continue our study of energy, we began learning about chain reactions. 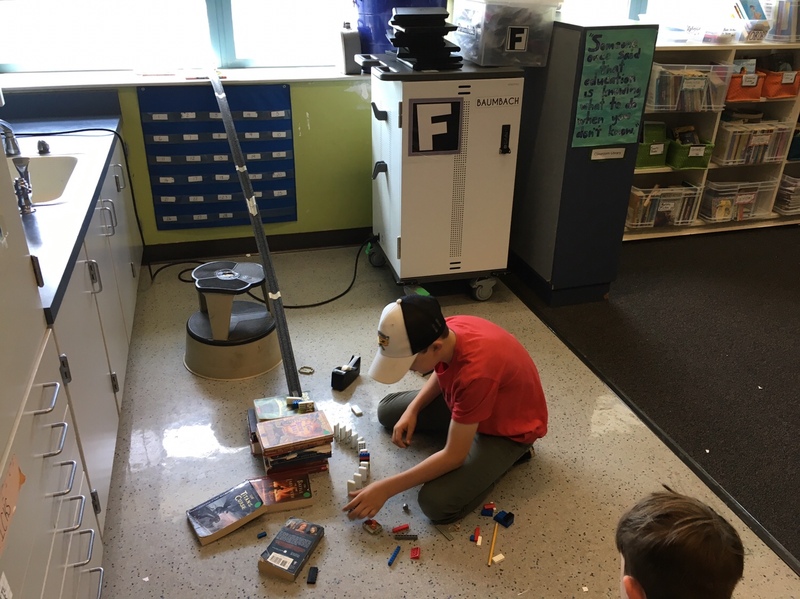 To get us started I shared this great video of a Rube Goldberg machine called “The Cake Server”. 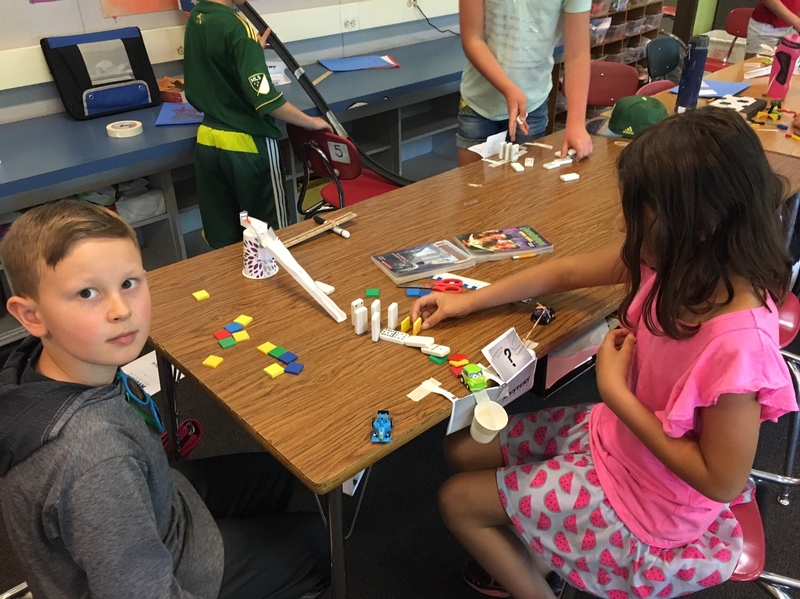 Enjoy the video and try to make your own Rube Goldberg machine at home. 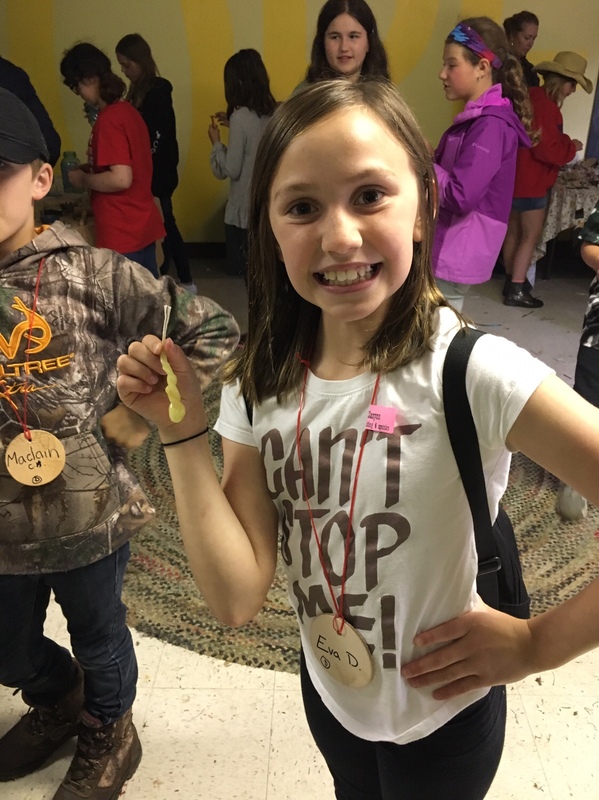 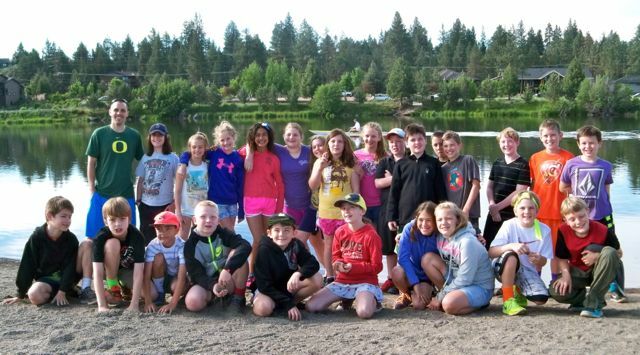 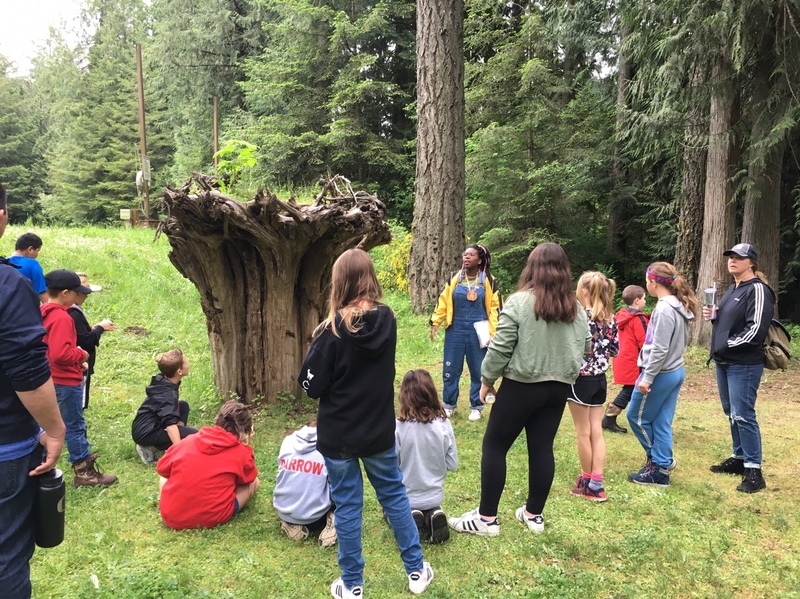 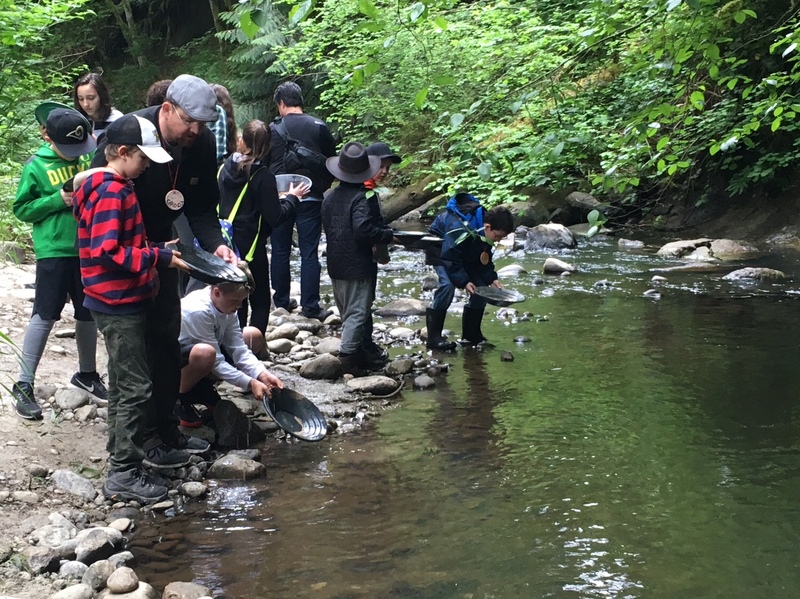 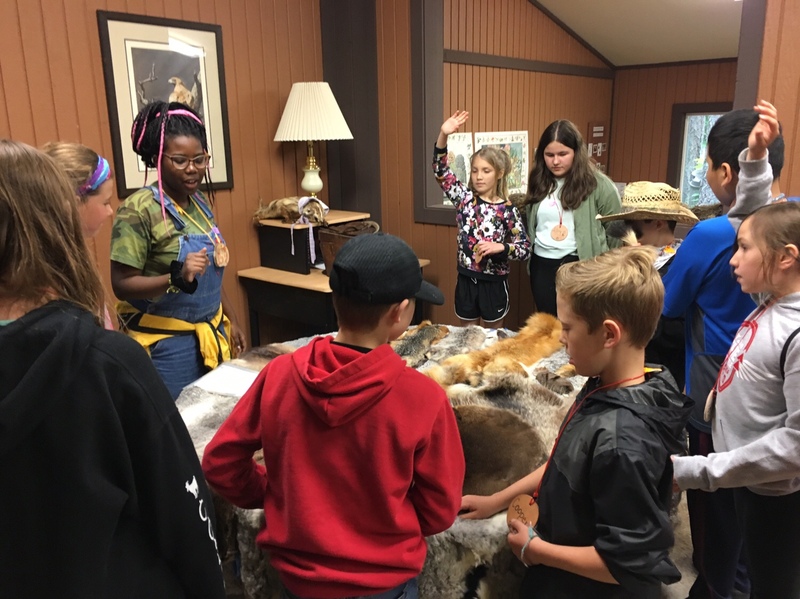 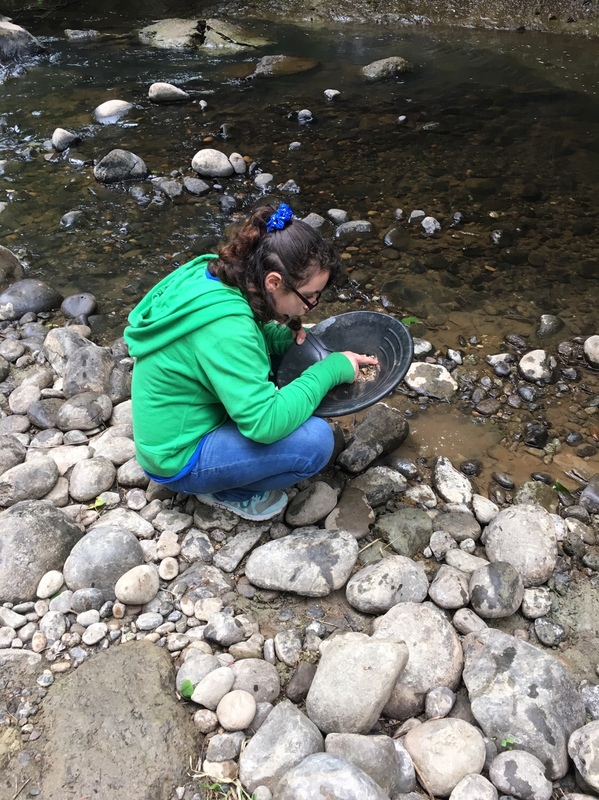 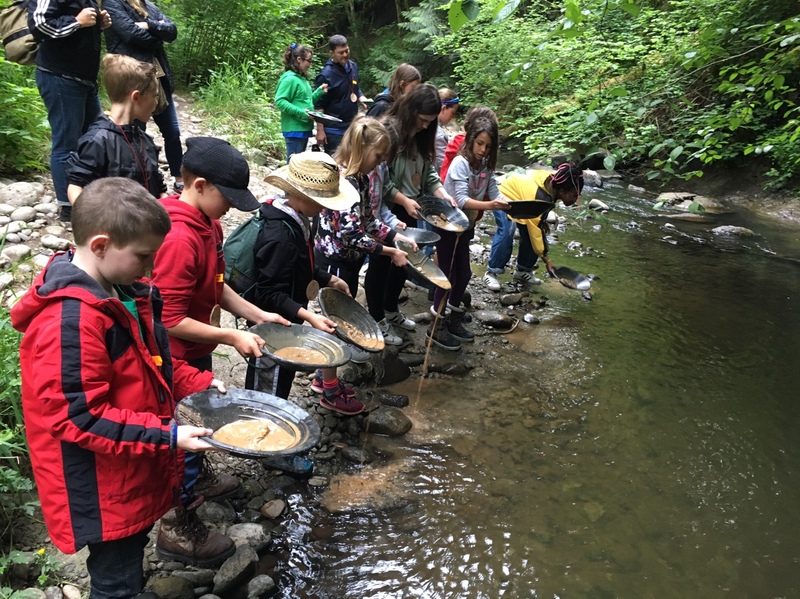 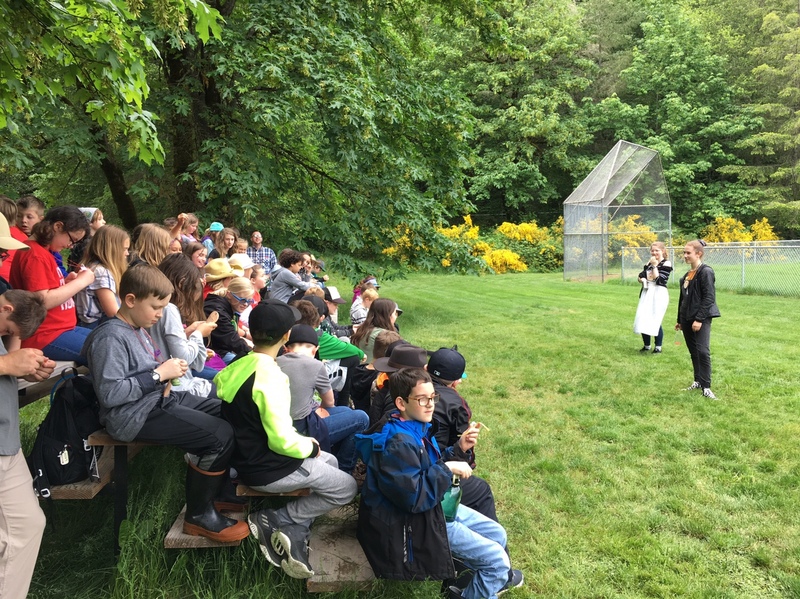 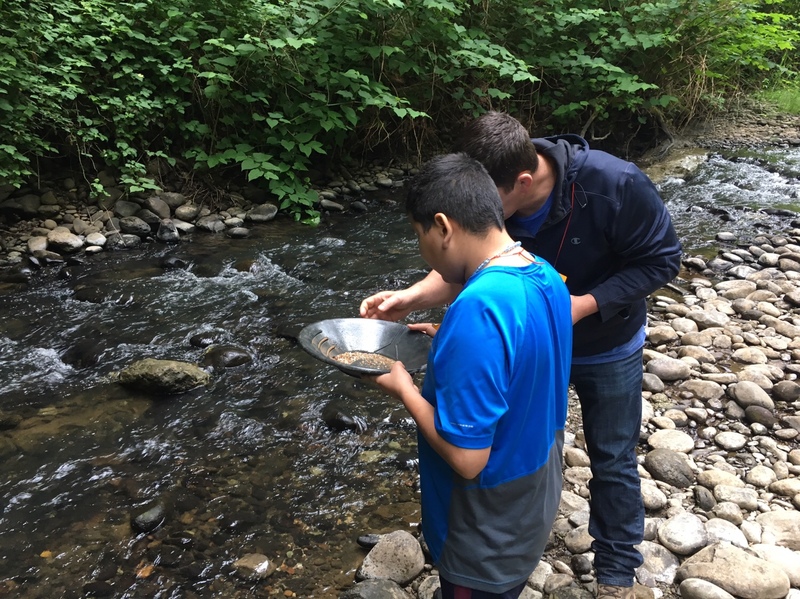 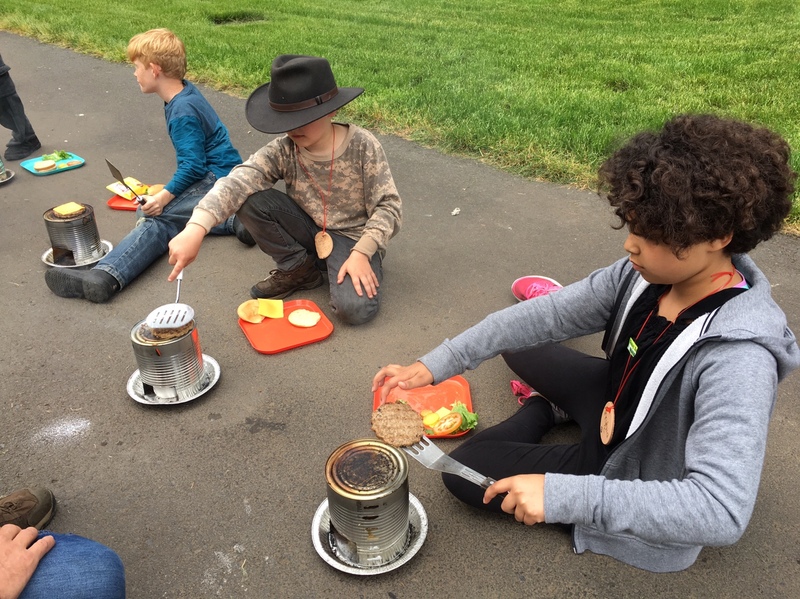 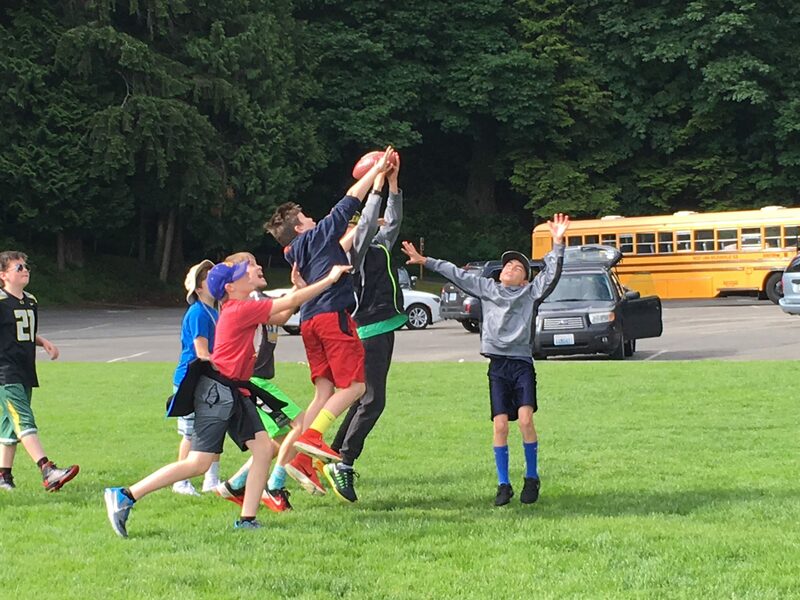 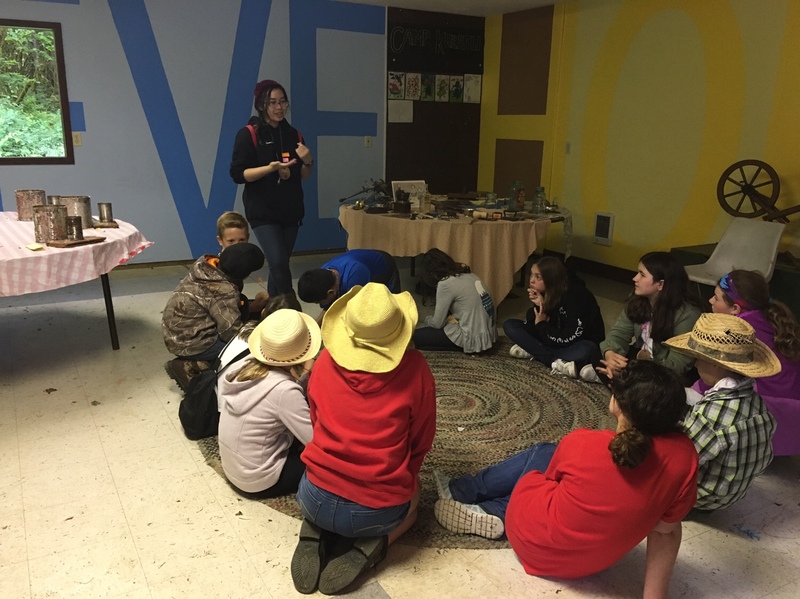 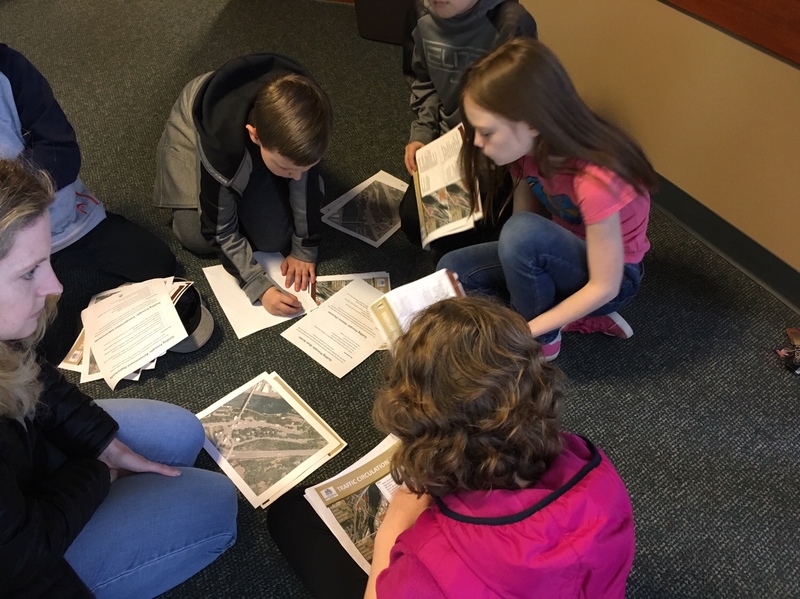 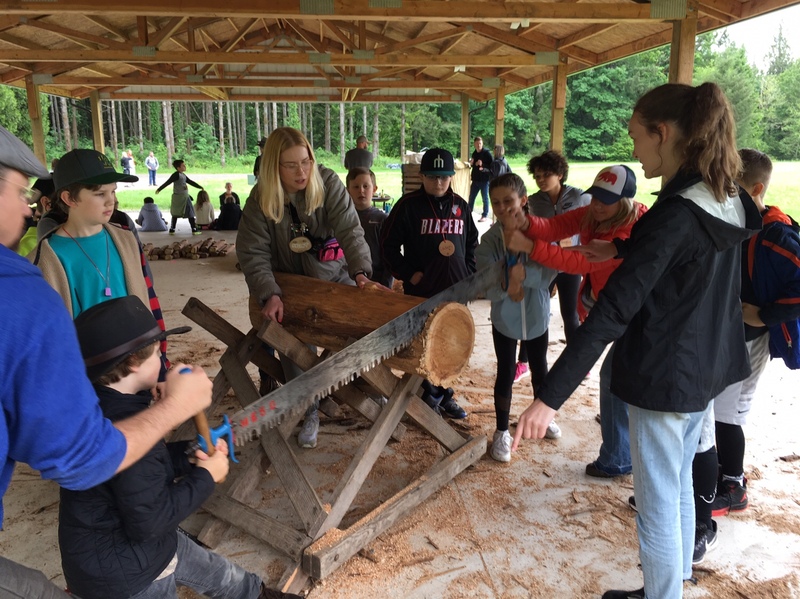 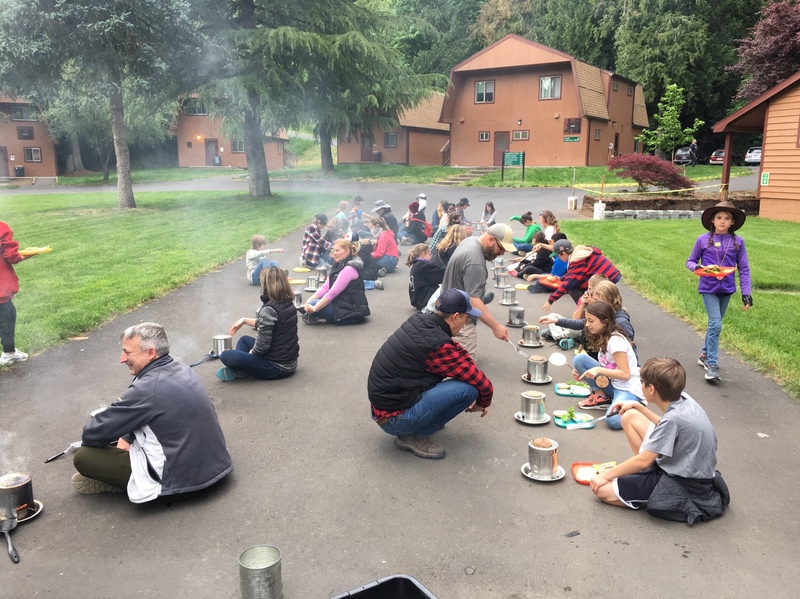 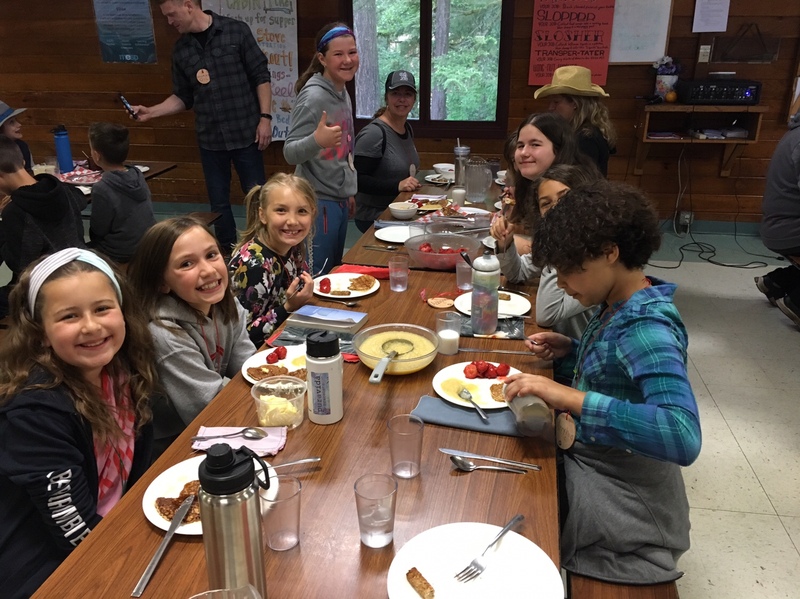 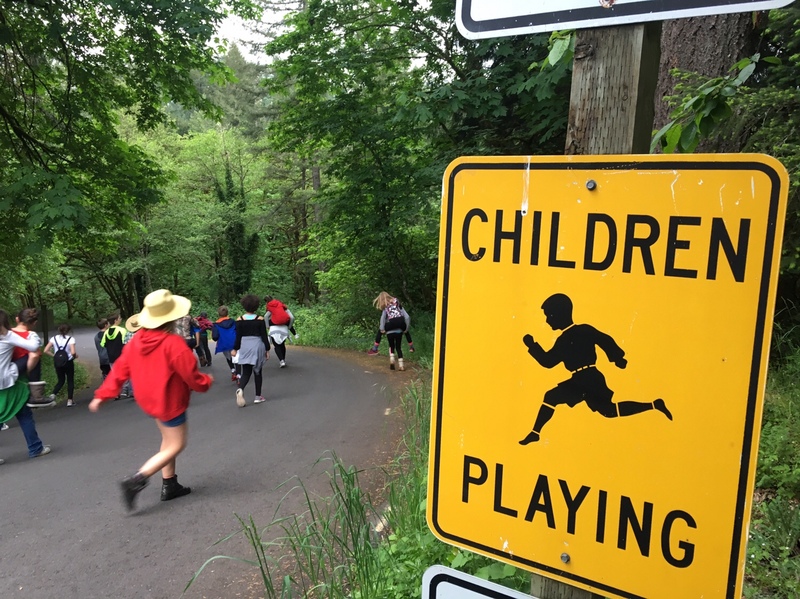 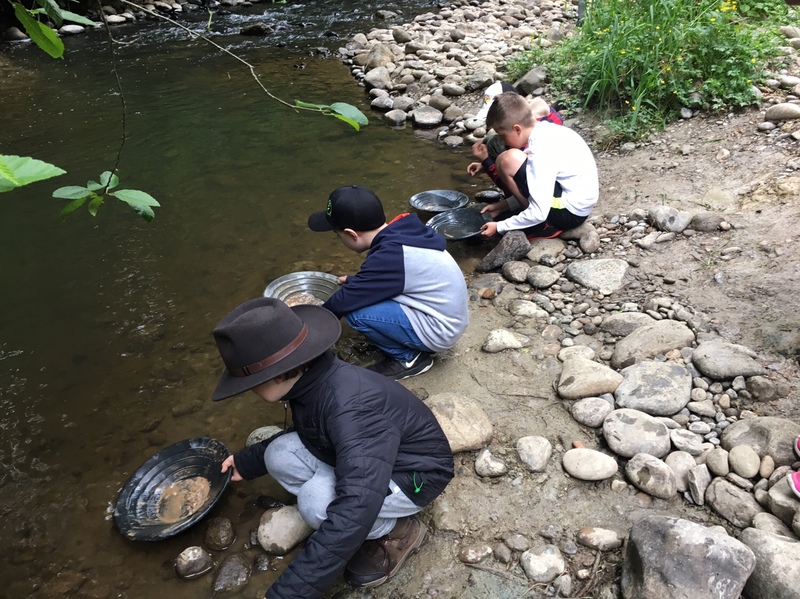 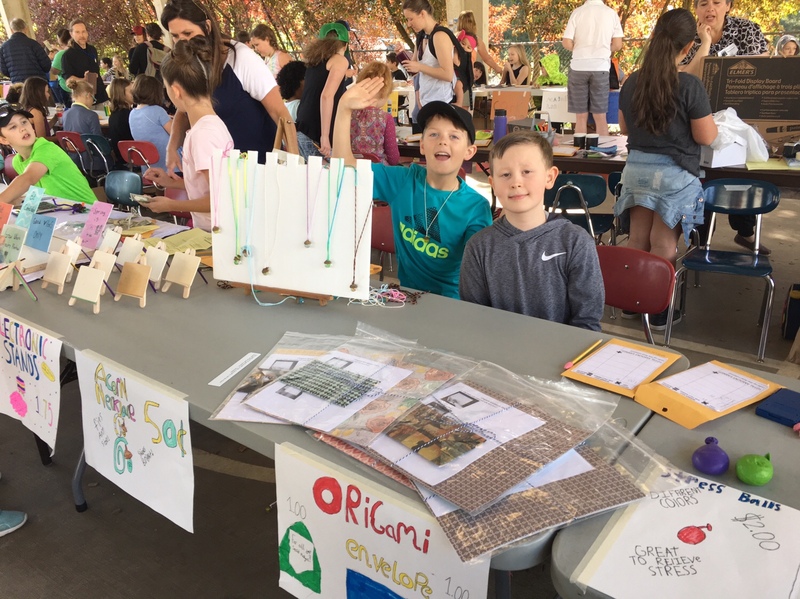 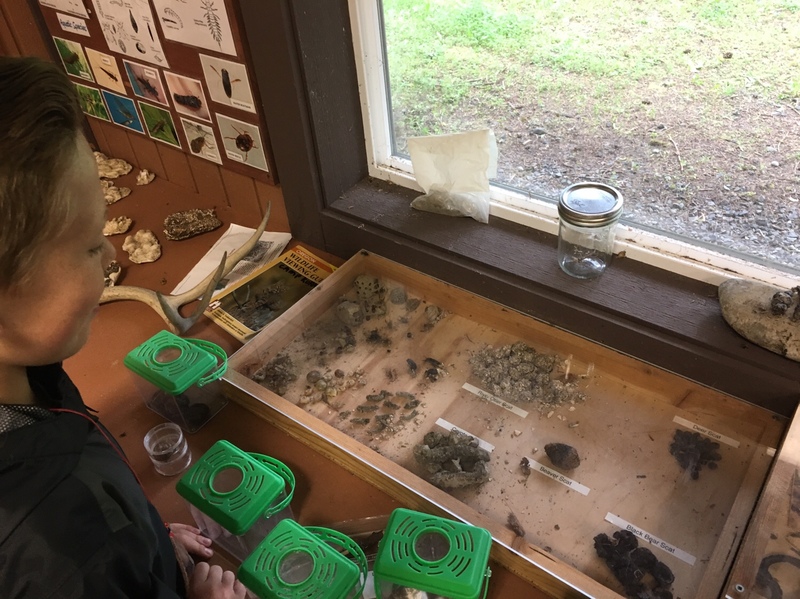 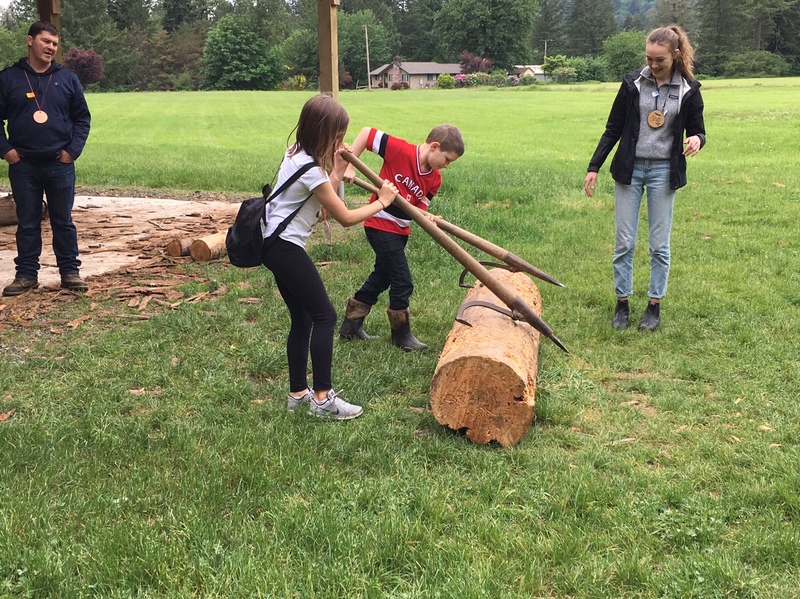 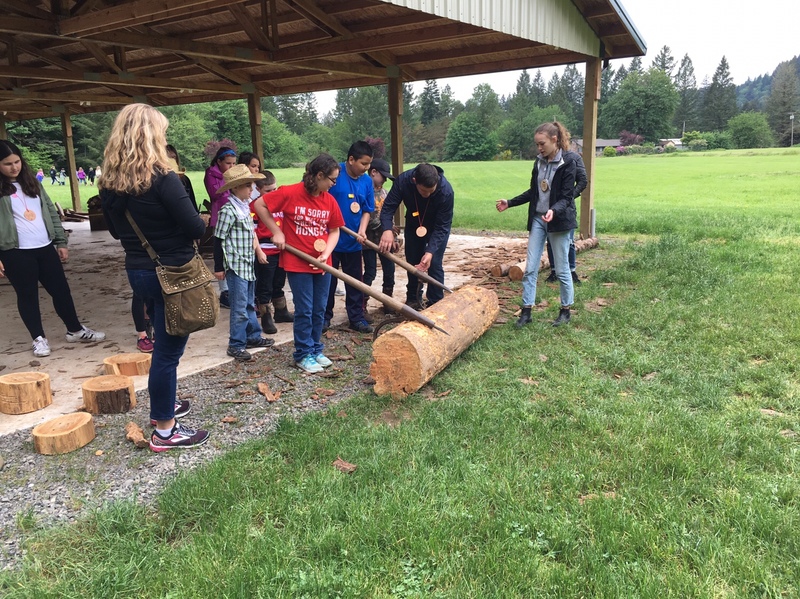 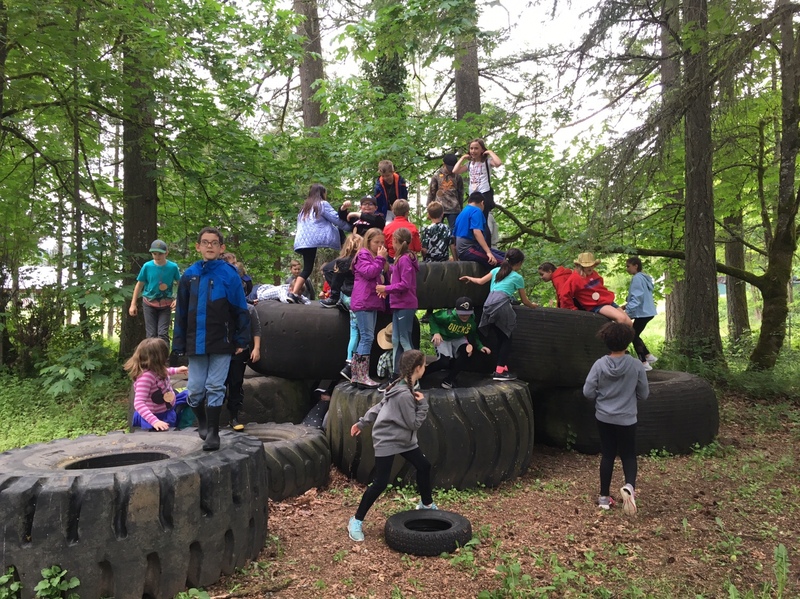 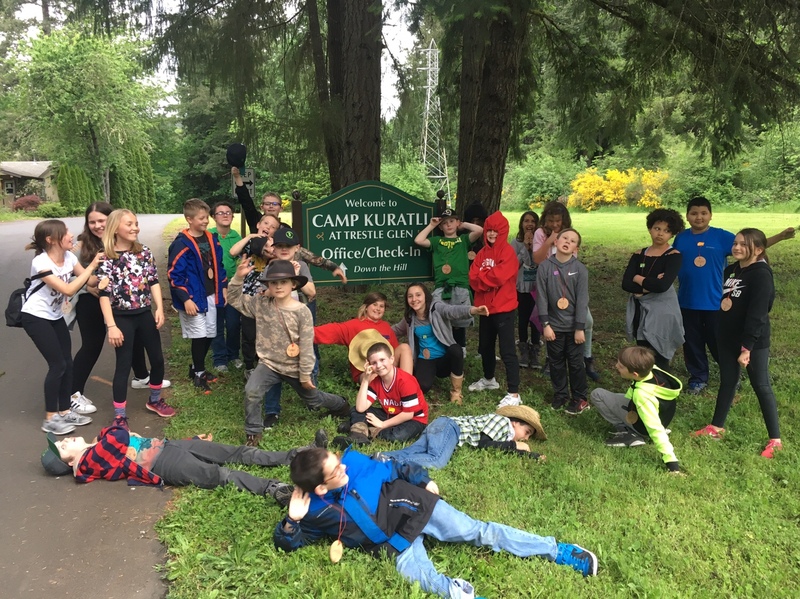 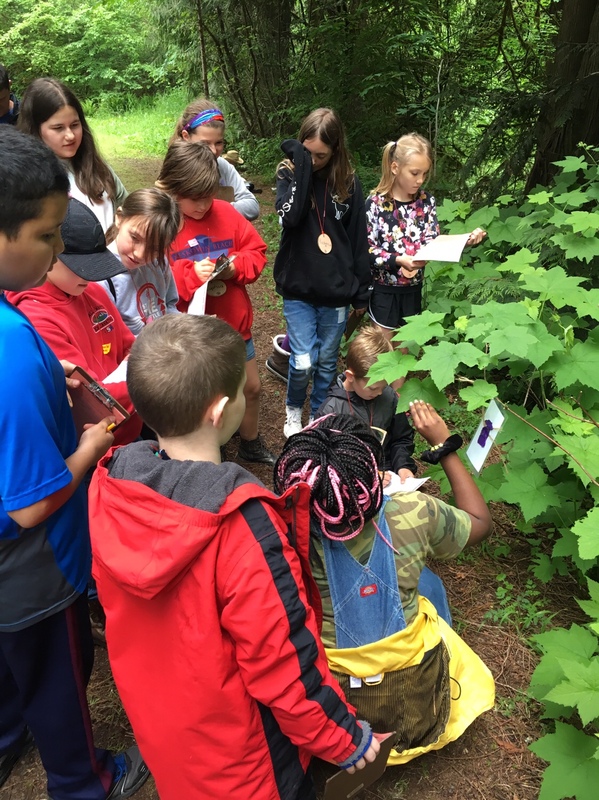 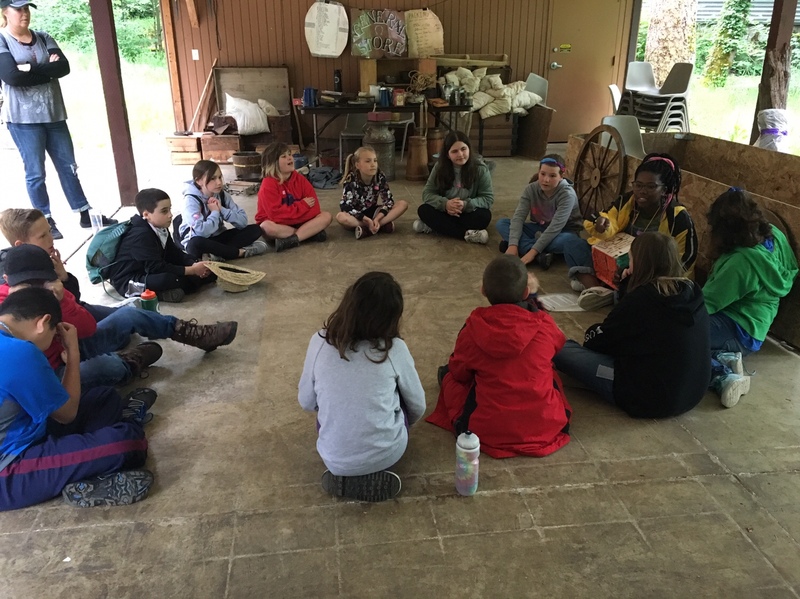 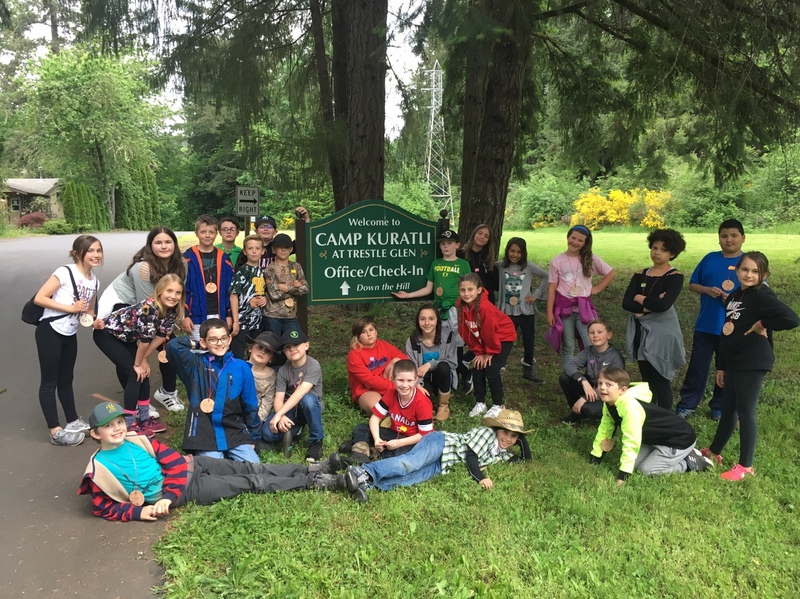 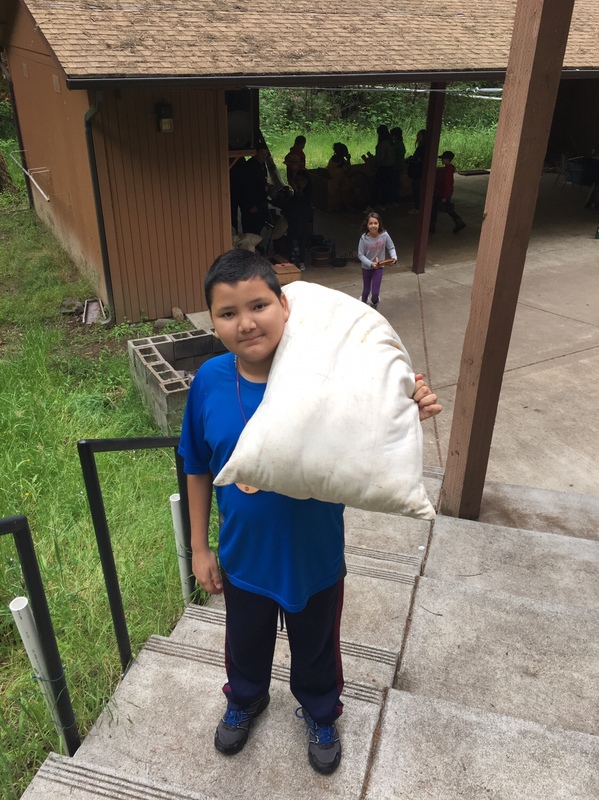 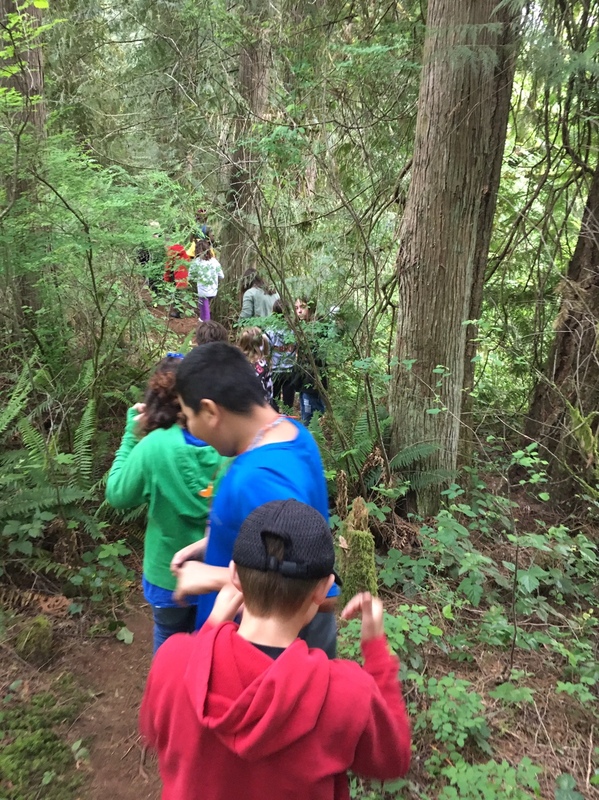 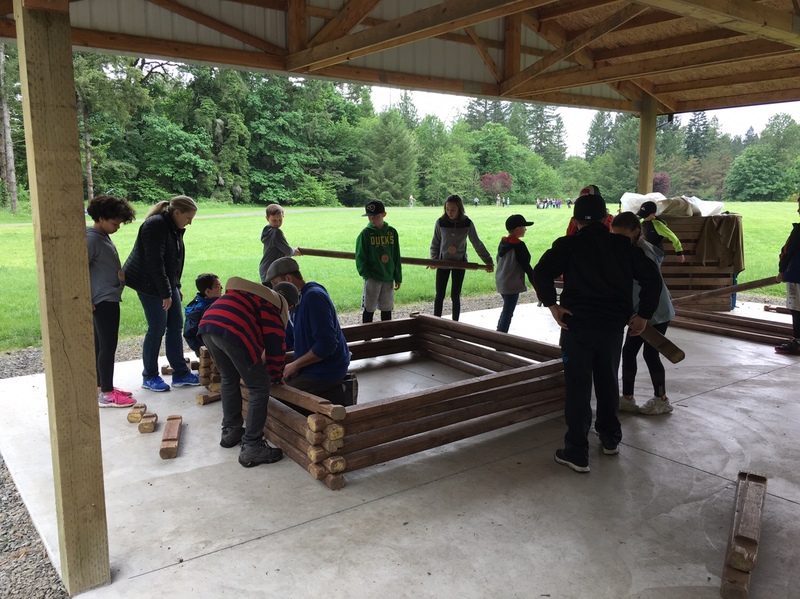 Students spent the past two days at Camp Kuratli, learning about the Oregon Trail and early pioneer life in the northwest. 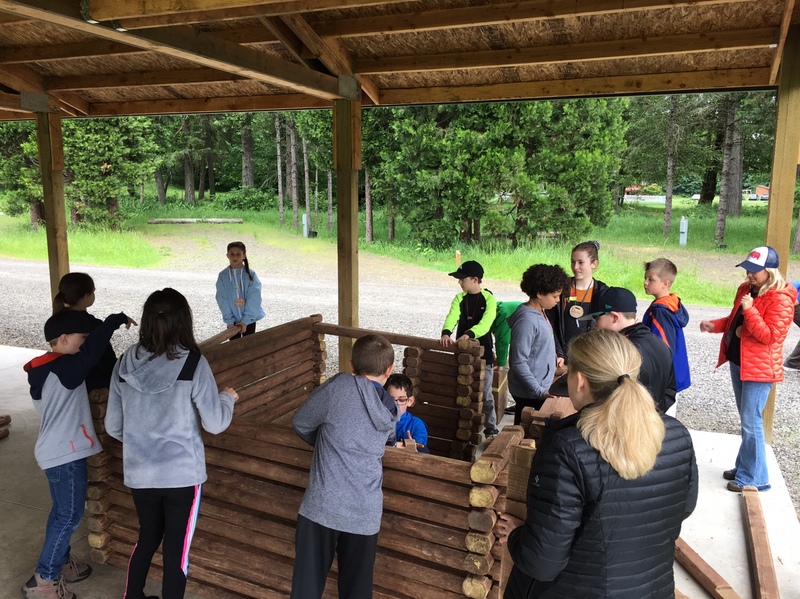 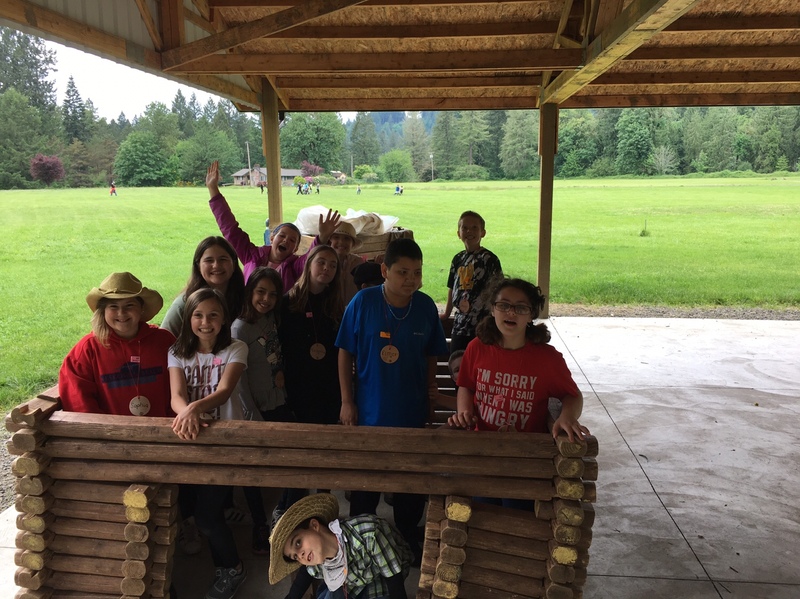 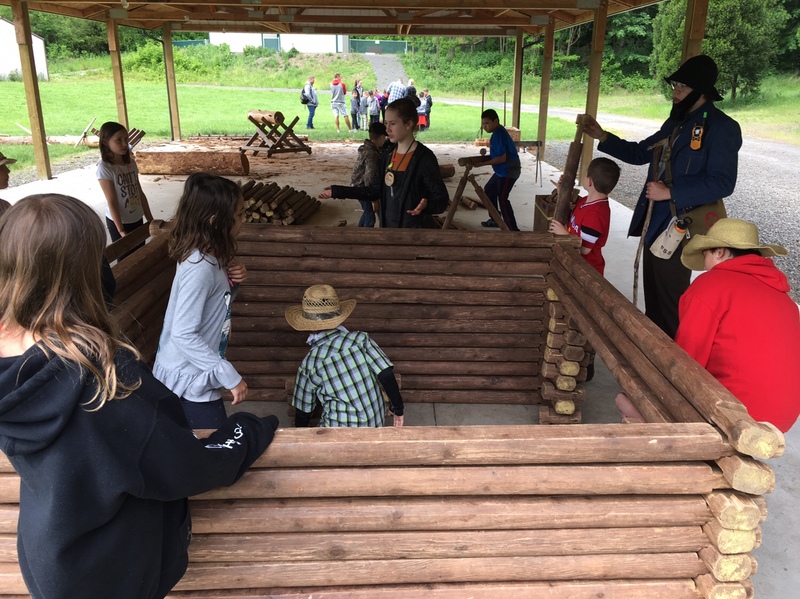 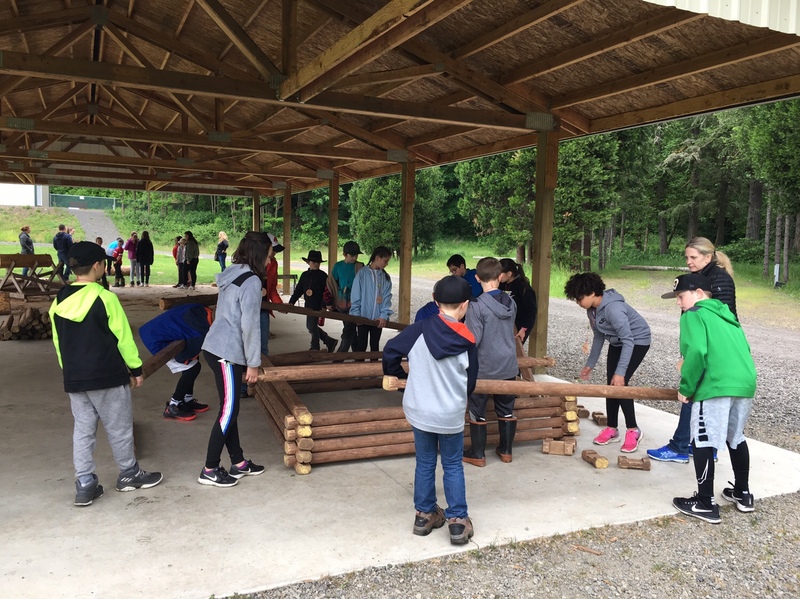 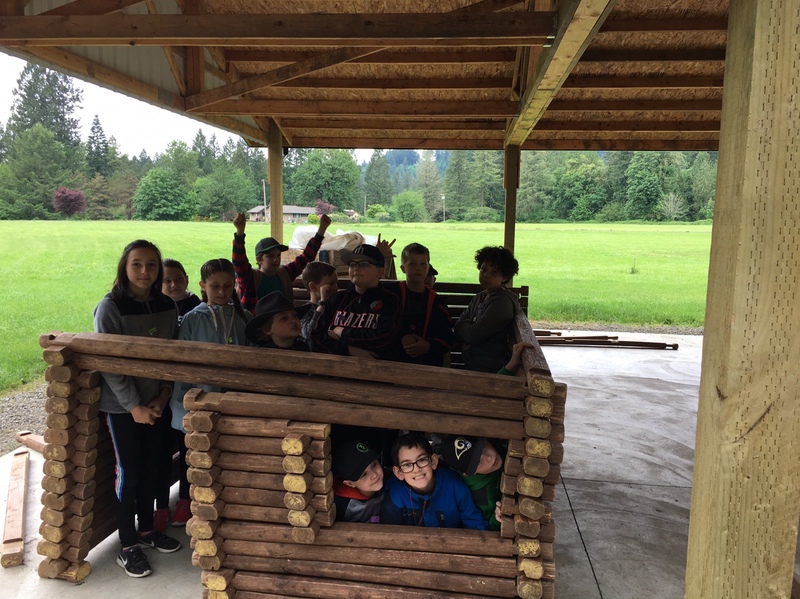 We had a blast building log cabins, making candles, sawing logs, mapping out an acre, churning butter, panning for gold, and learning about the plants and animals in the area. 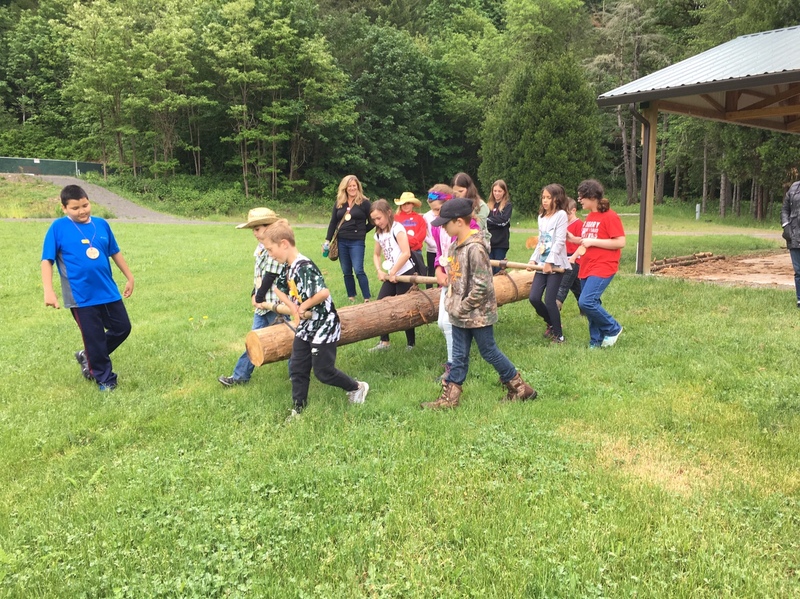 We also spent plenty of time playing pioneer games, dancing the Virginia Reel, having a cookout, and singing at the campfire. 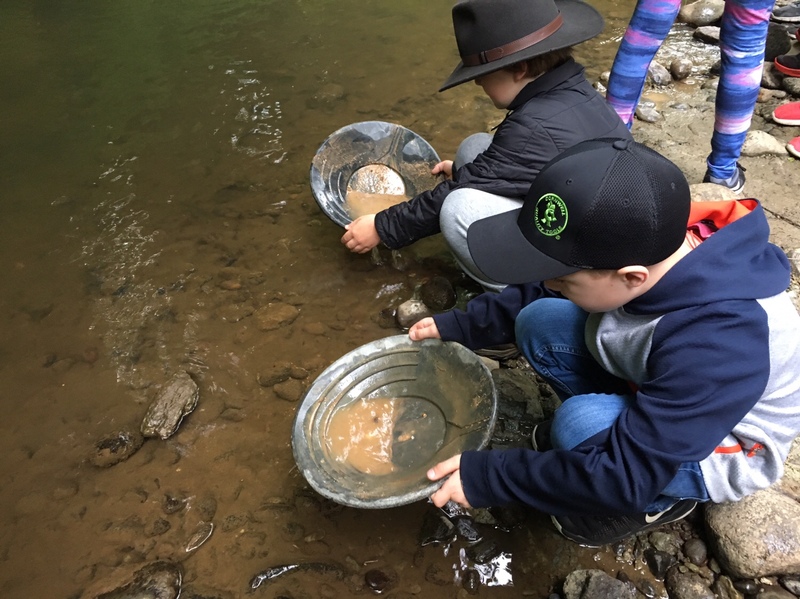 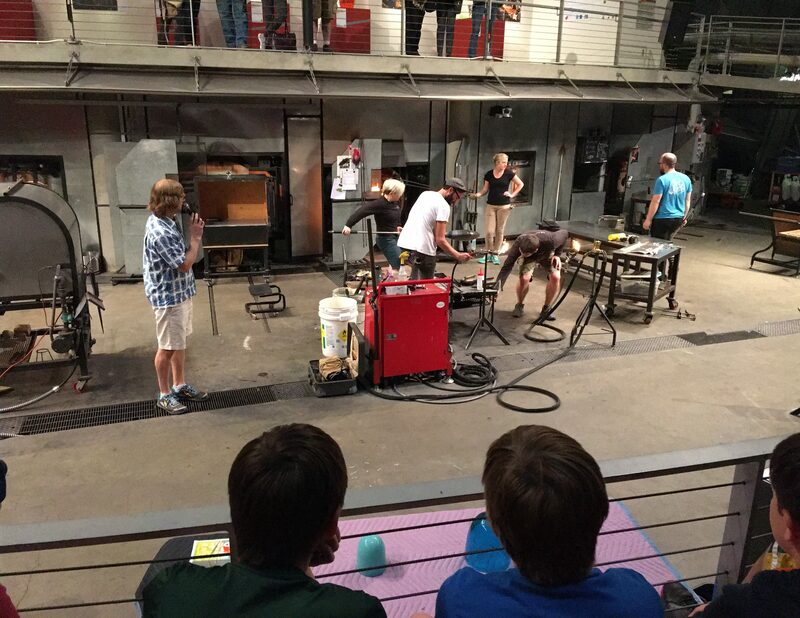 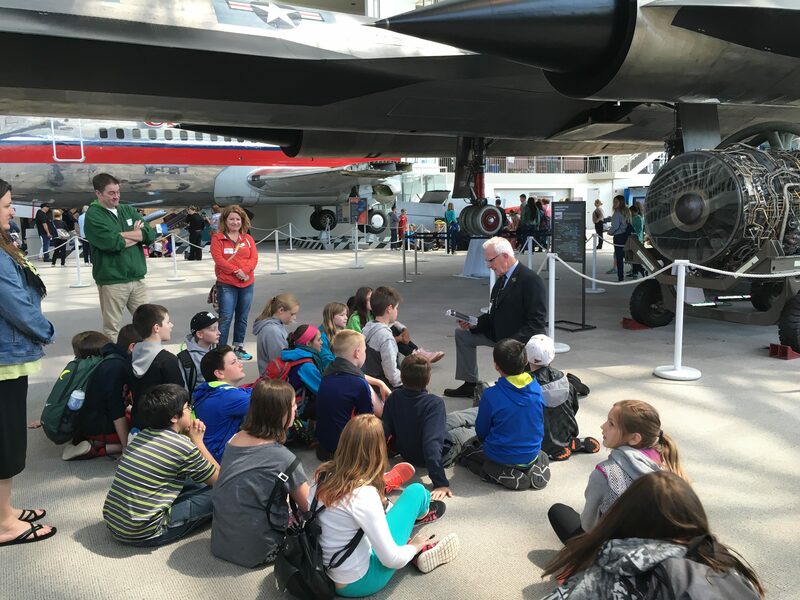 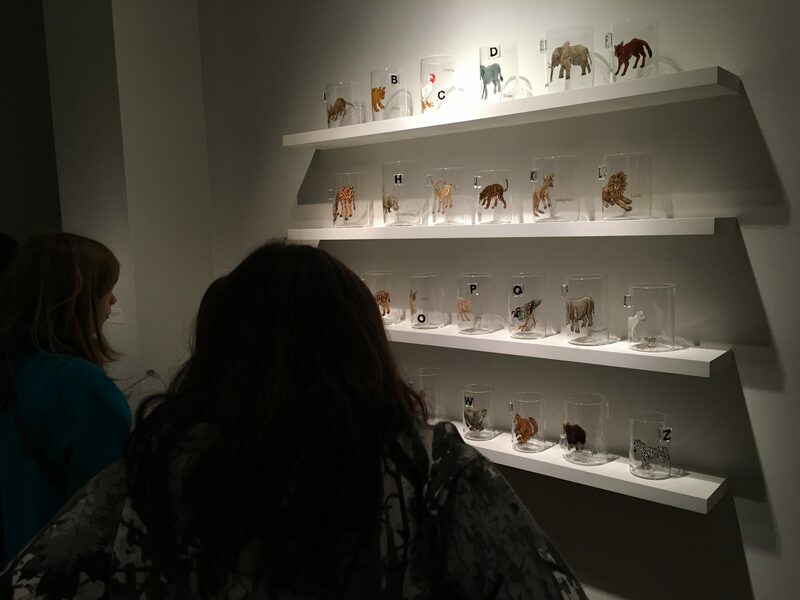 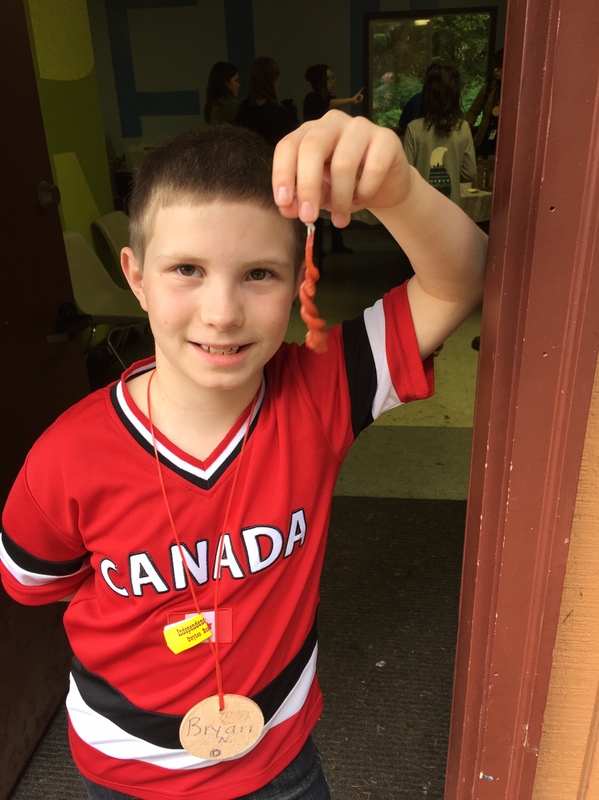 Be sure to ask your child about the things they learned on this wonderful experience. 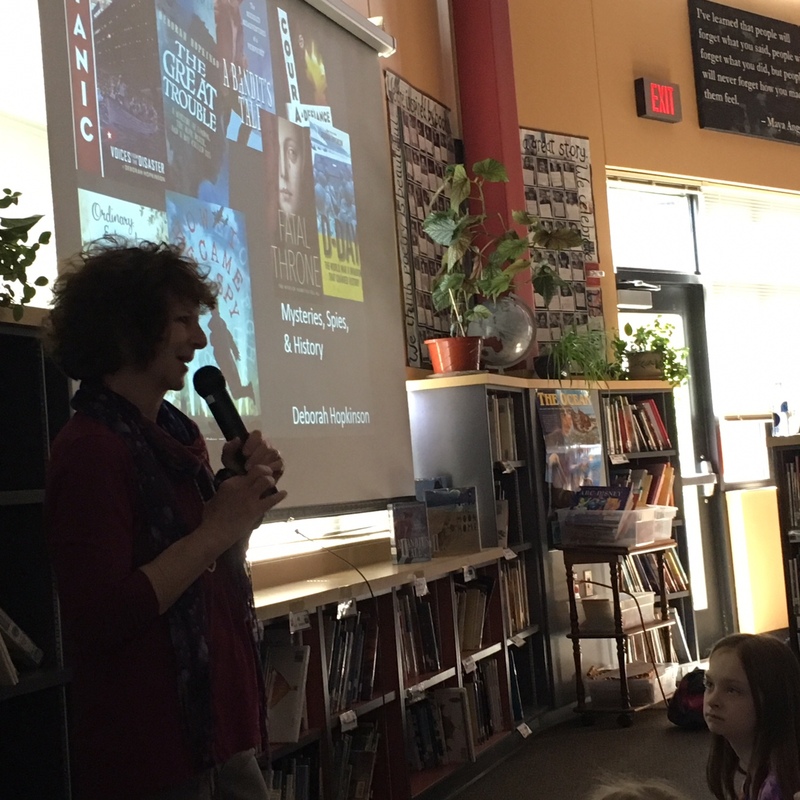 This week we were lucky enough to have author Deborah Hopkinson join us. 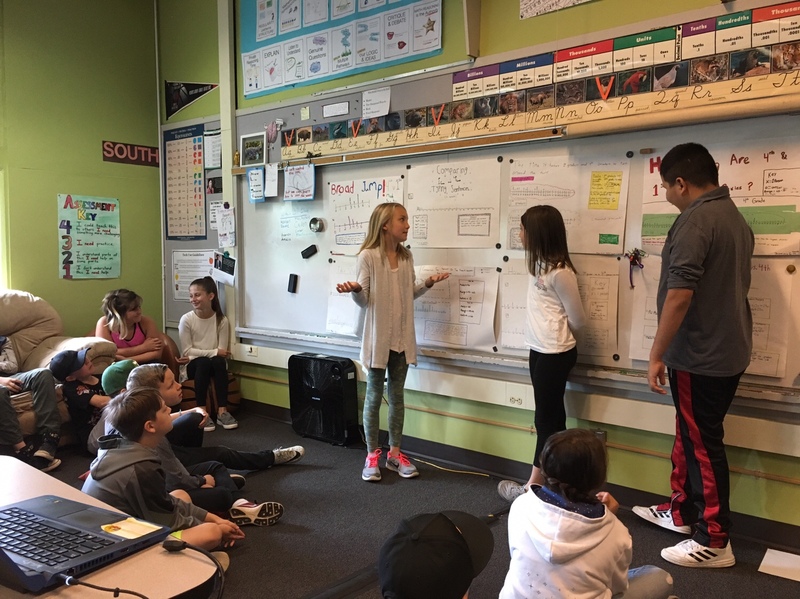 She spent an hour with the fourth graders in the library telling us about her writing process. 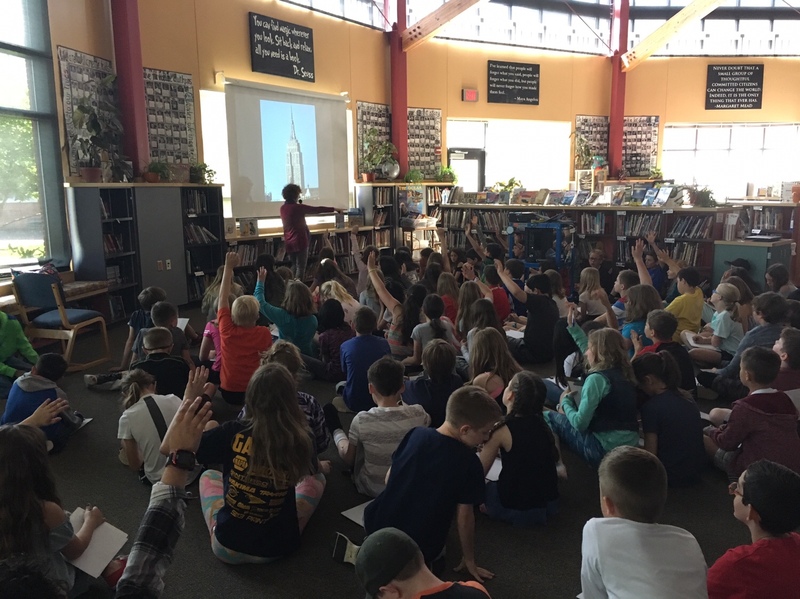 We learned about how she researches her historical fiction books and what her illustrators do to bring her words to life. 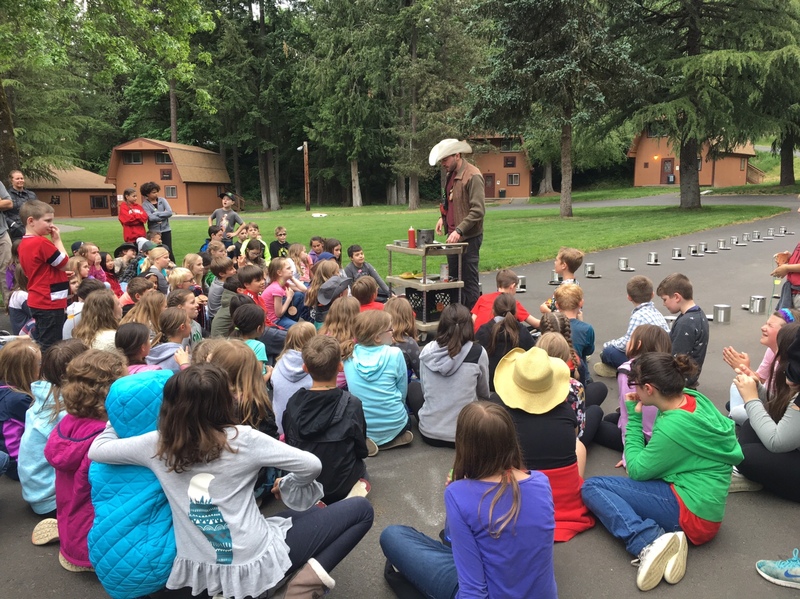 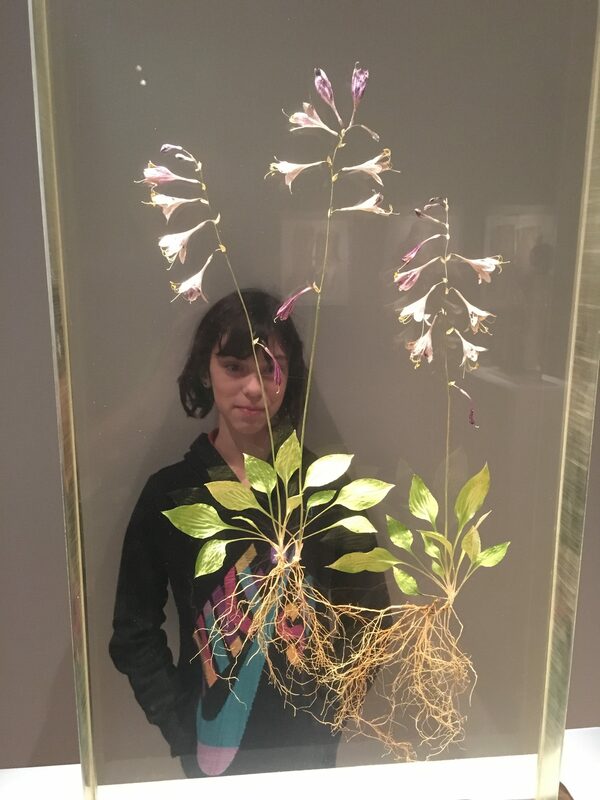 It was a fantastic experience and we are thankful the PTA brought her to Willamette. 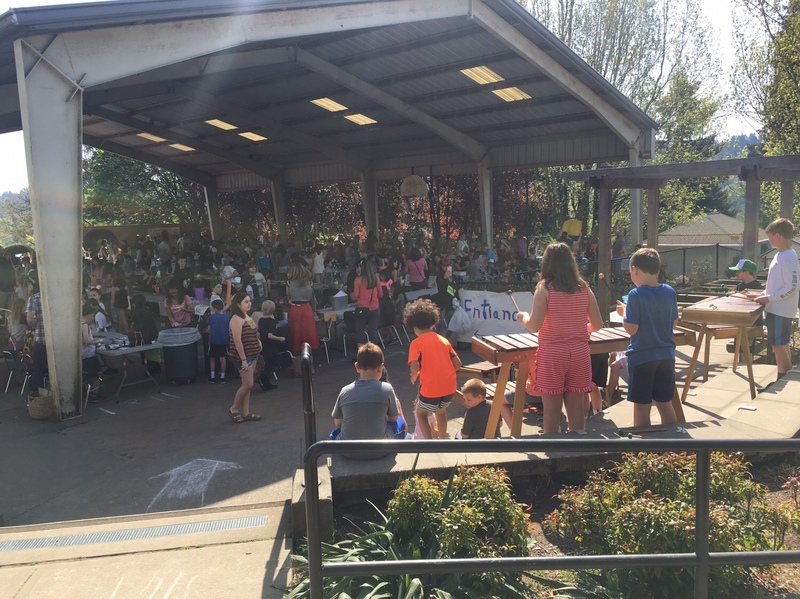 Another successful Willamette Market was held today. 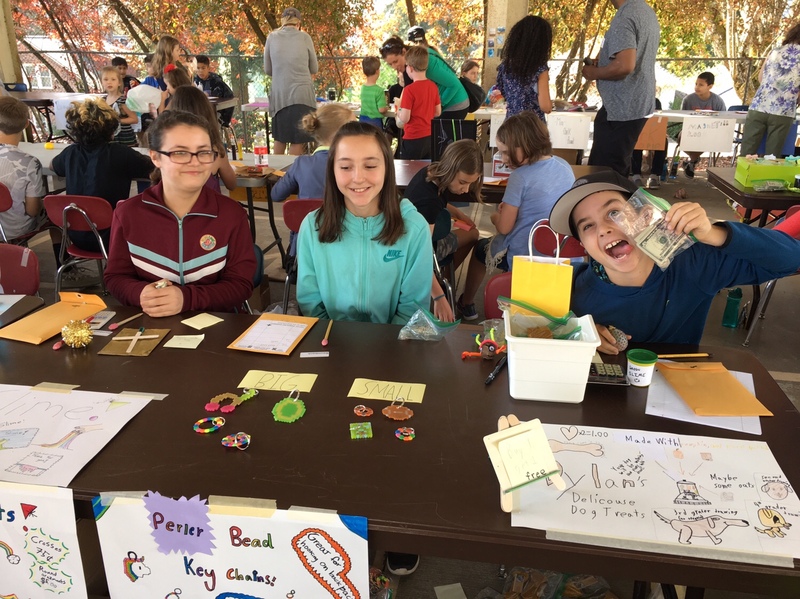 The sun was shining, marimba sounds filled the air, and plenty of handmade goods were exchanged for cold hard cash. 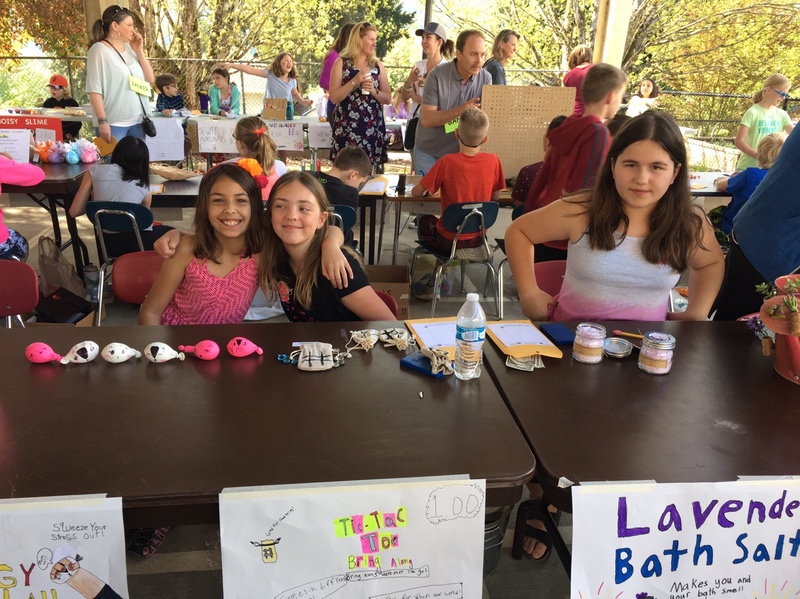 As always, students impressed with their creativity and dedication to their sales. 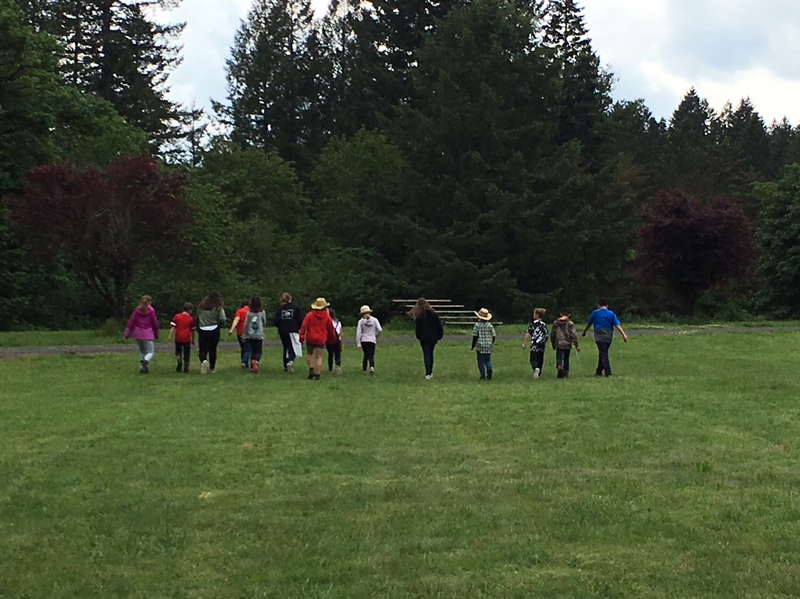 Thanks to everyone for helping to make this such an enjoyable experience. 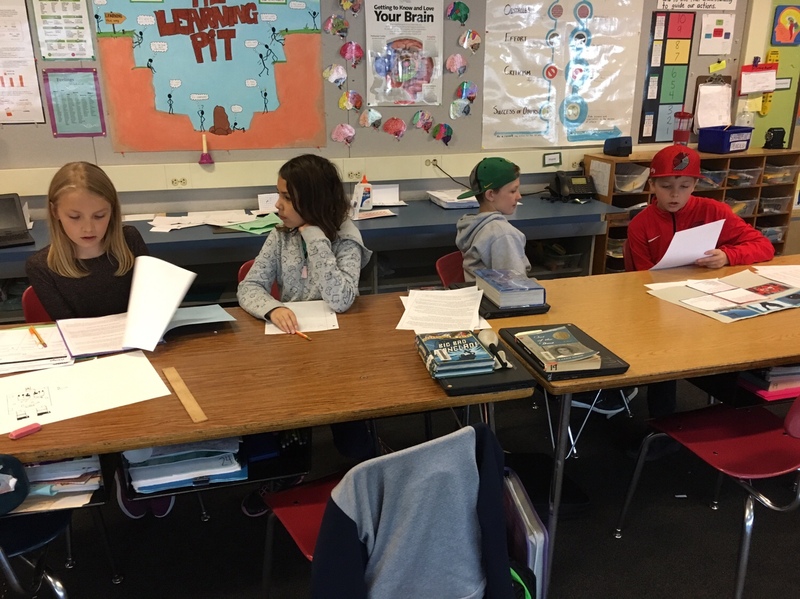 Students have been hard at work preparing for student-led conferences. 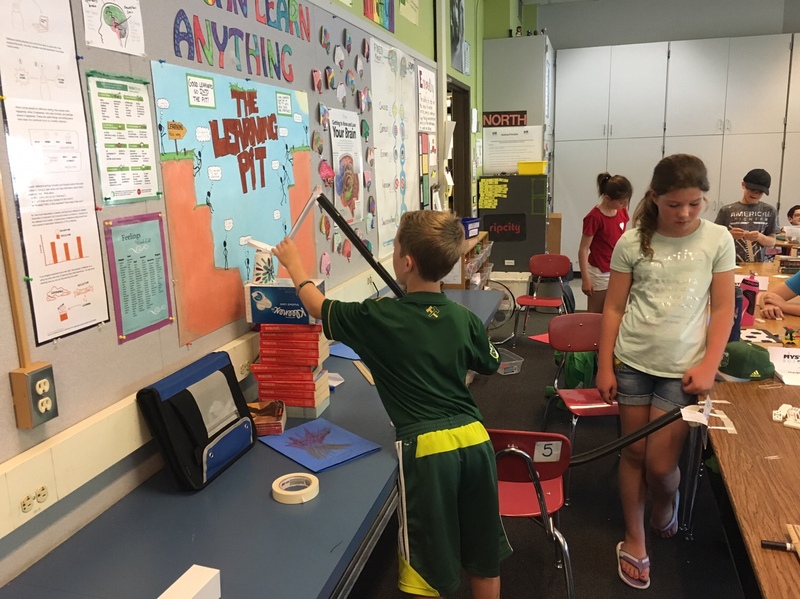 Today we practiced with classmates and figured out what we needed to adjust for the big day next week. 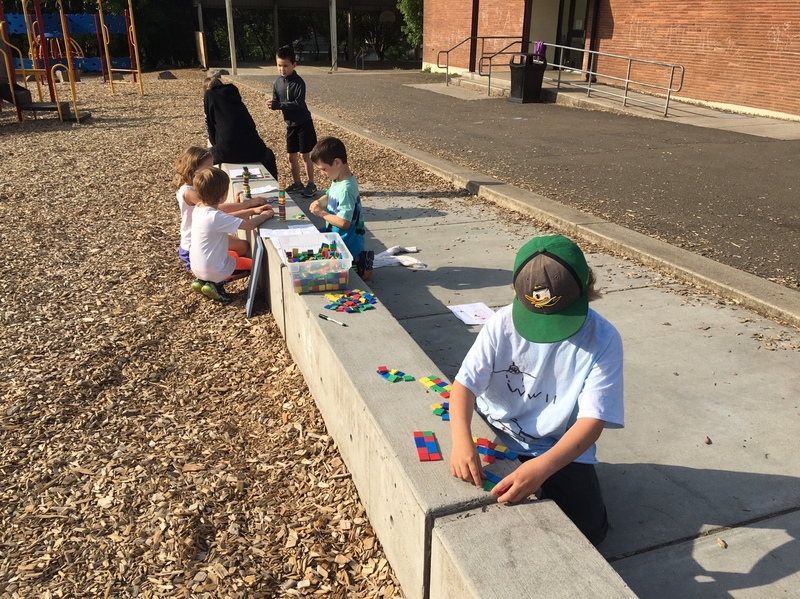 We are all looking forward to sharing our reflections with parents! 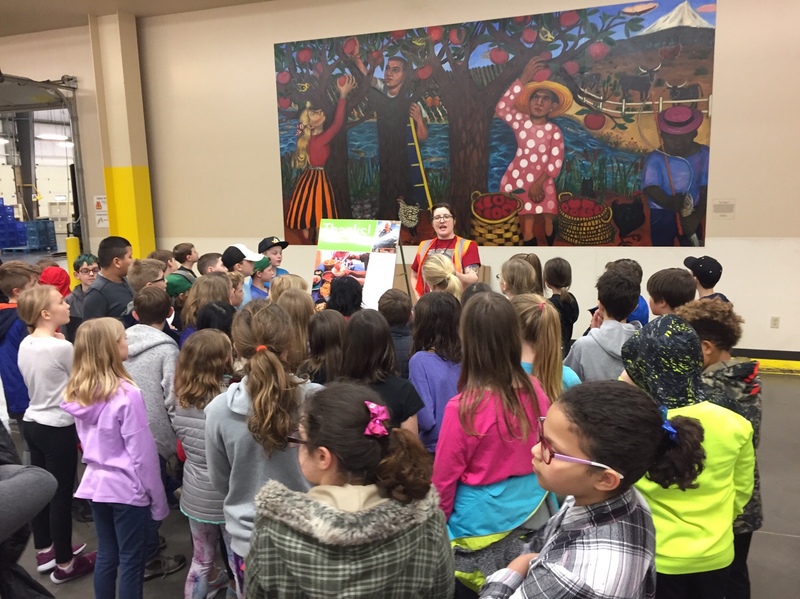 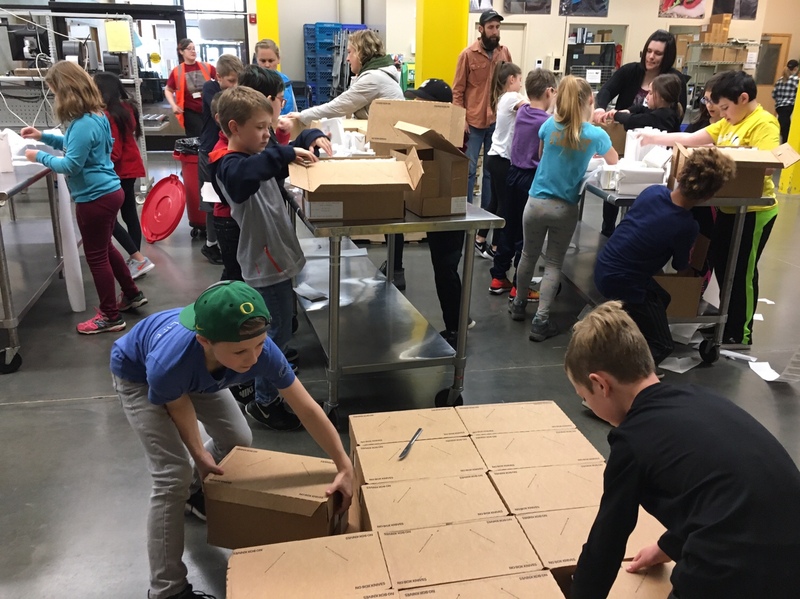 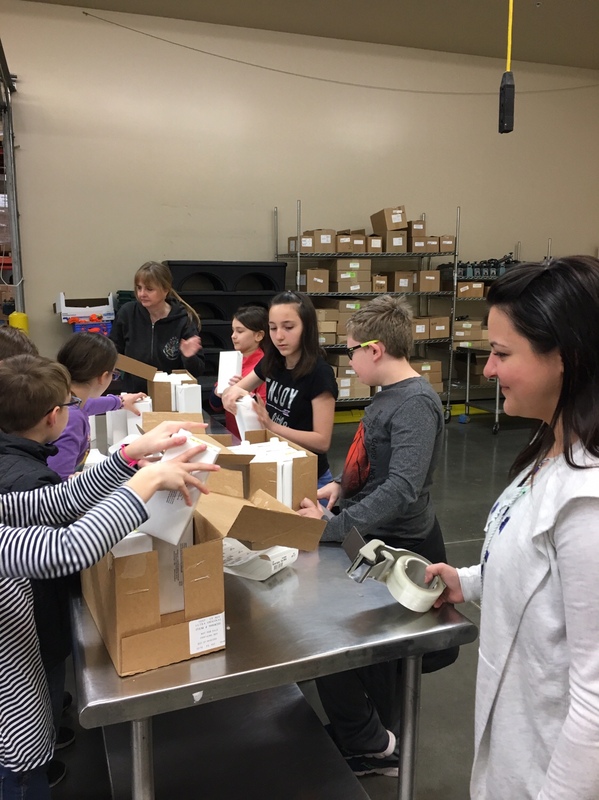 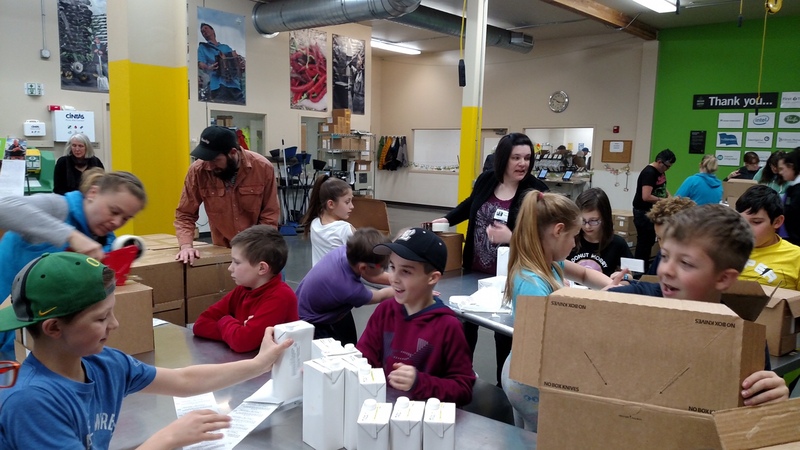 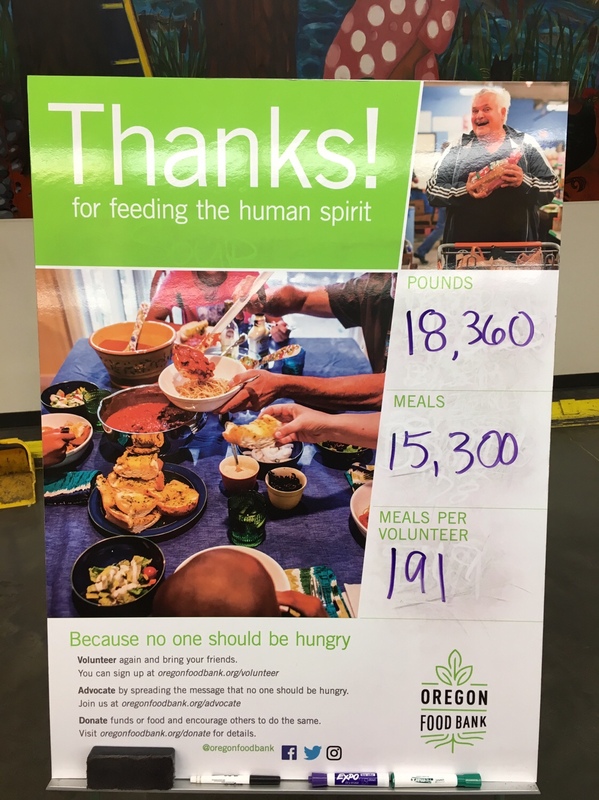 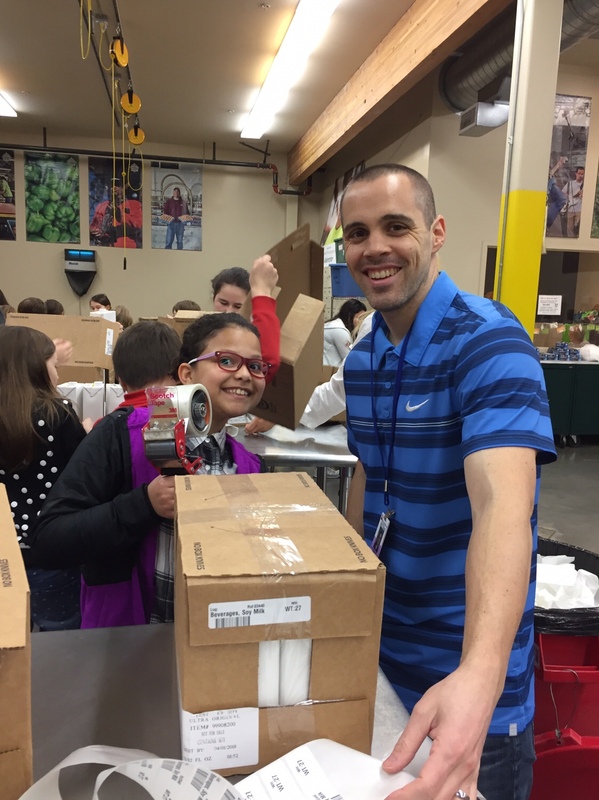 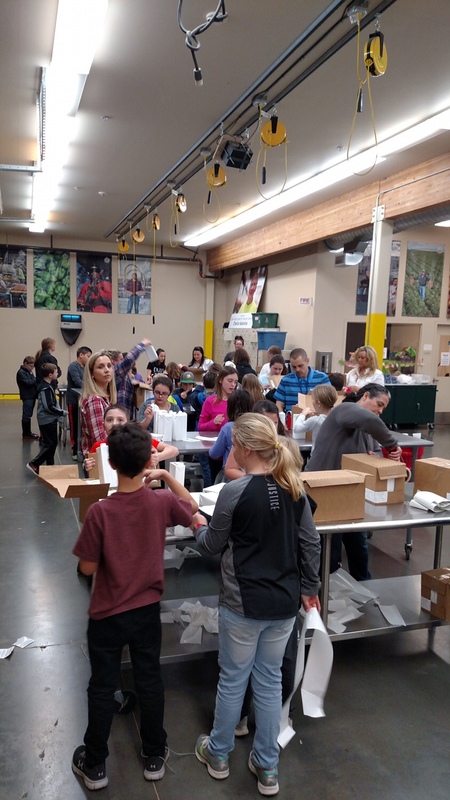 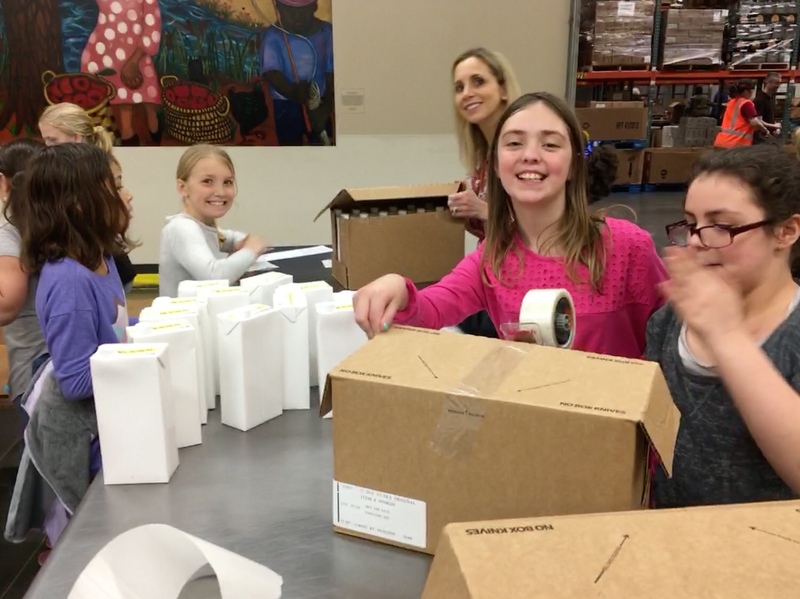 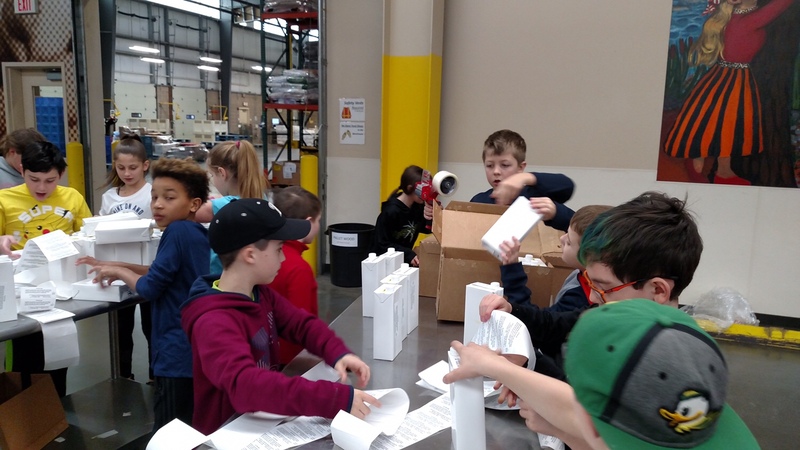 Today we spent our morning at the Oregon Food Bank, helping to prepare soy milk for distribution in food boxes. 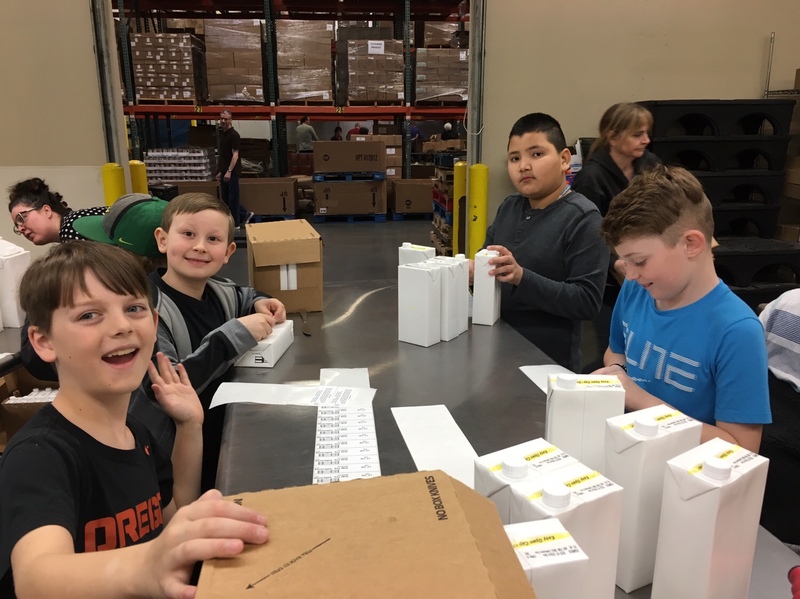 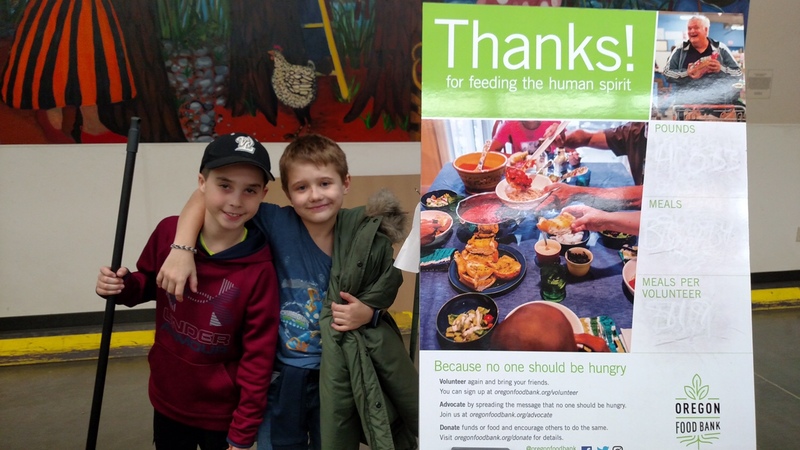 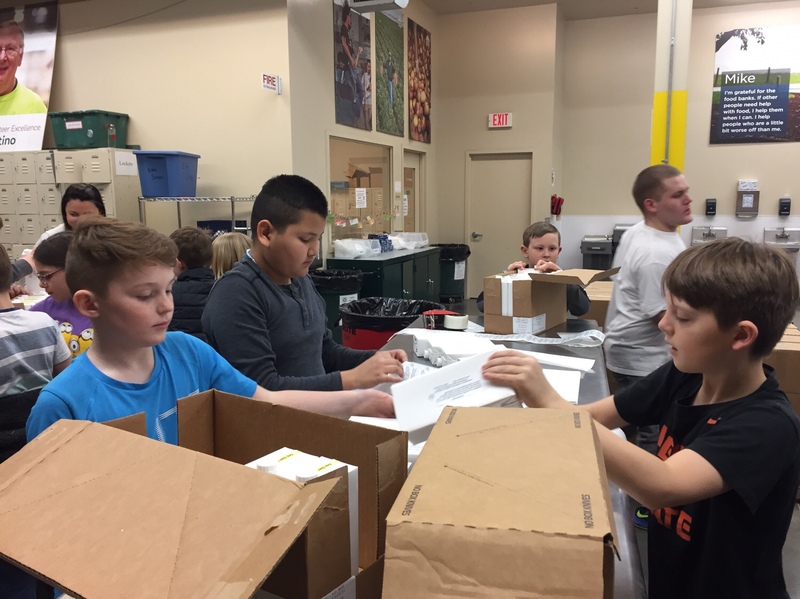 Students had a great experience volunteering their time and working together to help other people out. 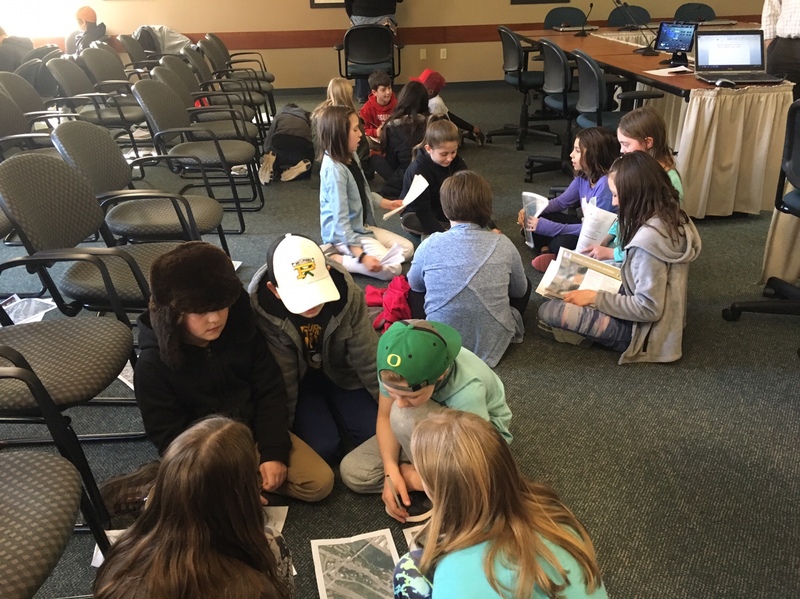 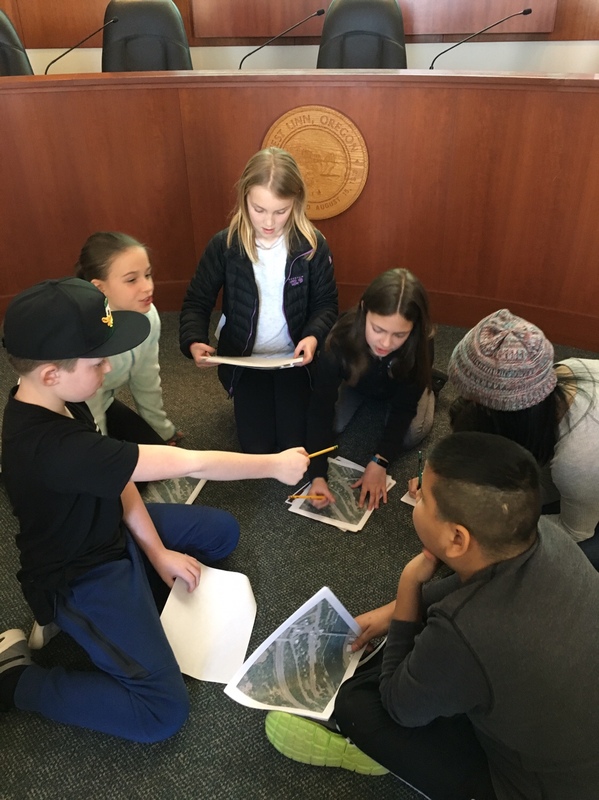 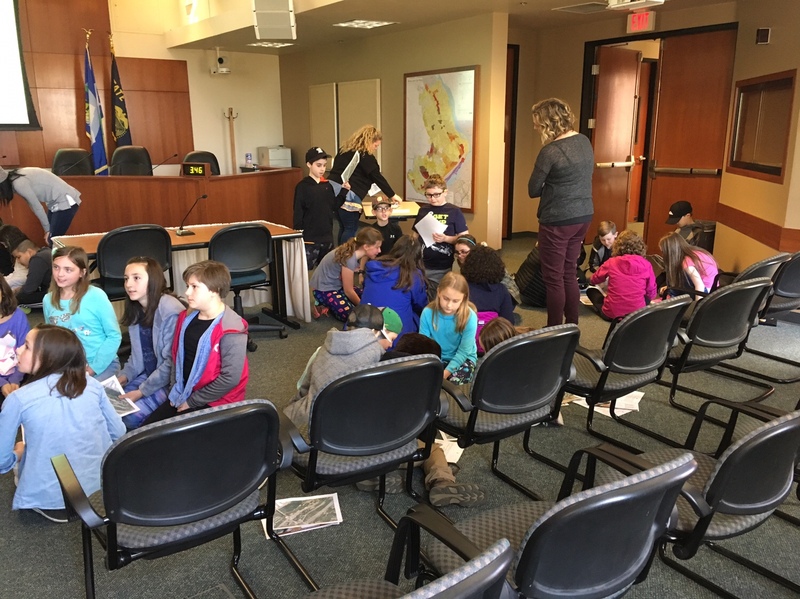 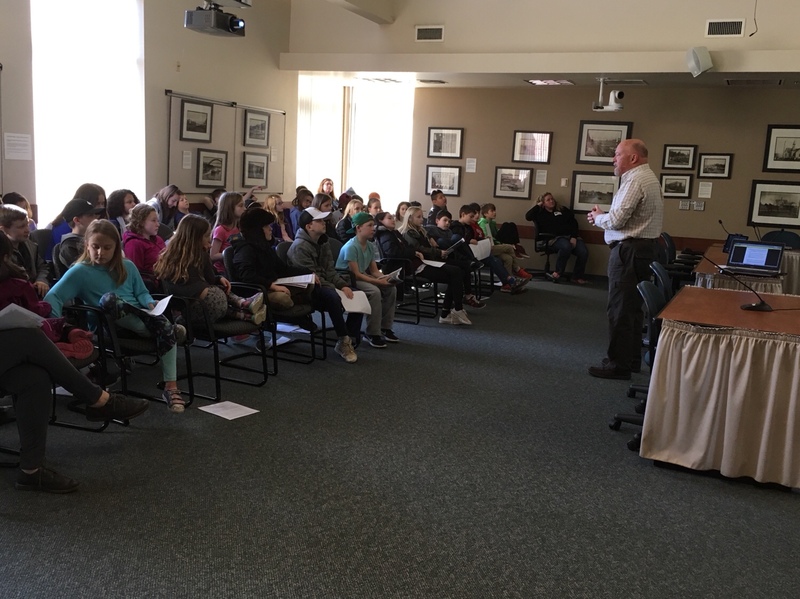 Today we took a field trip to City Hall to speak with the enthusiastic and friendly John Morgan, the project manager for West Linn’s Waterfront Project. 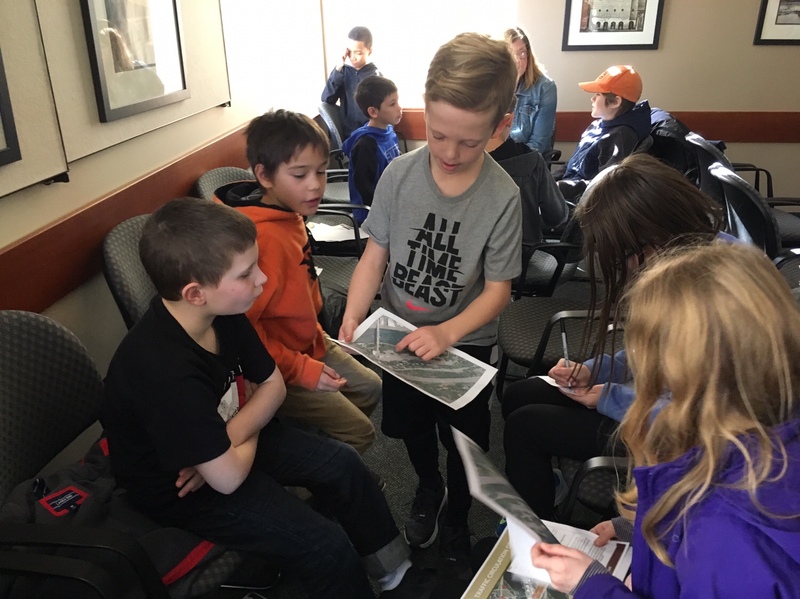 Our objective was to become more familiar with the Old City Hall District because students will be creating a model featuring their ideas for redevelopment of the area. 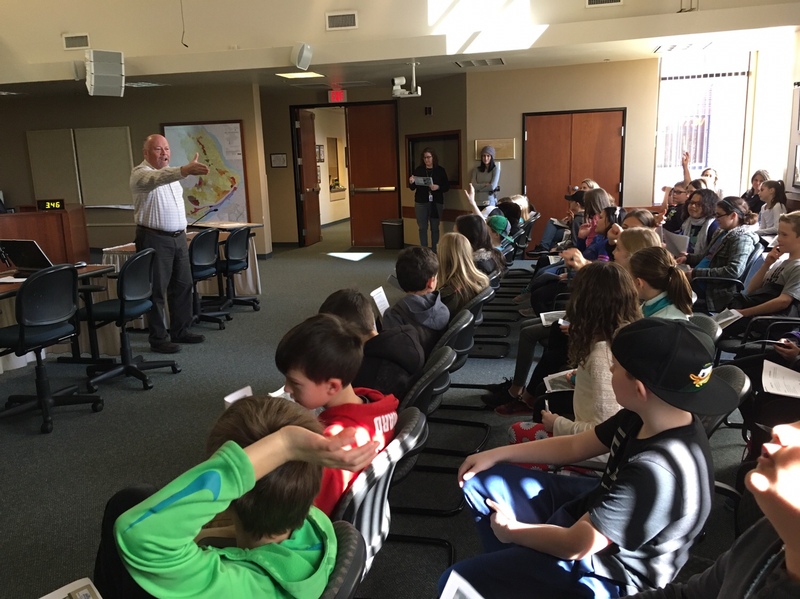 Mr. Morgan taught us about the history of the Willamette Falls area and the old Willamette Paper Mill. 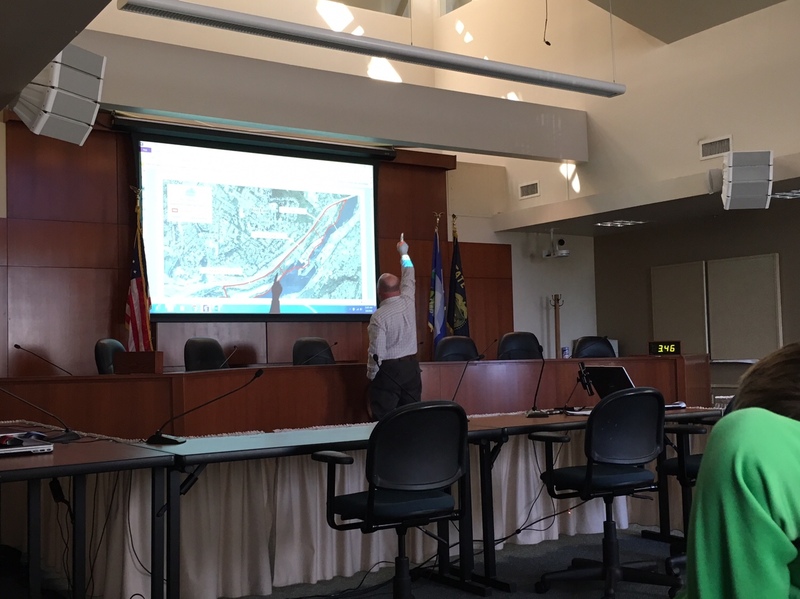 We learned that the closing of the old paper mill presented an opportunity to the city to develop the land for more public use. 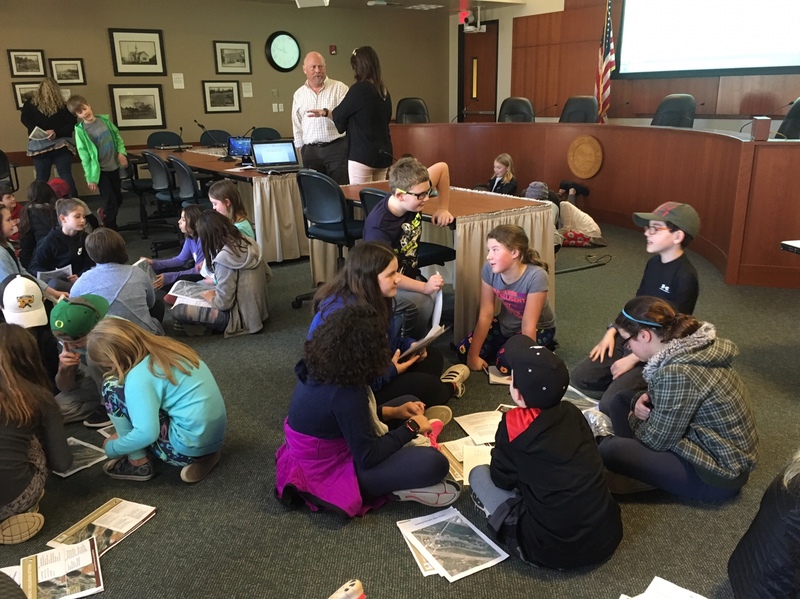 We learned about the city’s guiding principles for the project, which included river access, transportation improvement, preserving the historic character of the area, and the opportunity to reinvest in the community. 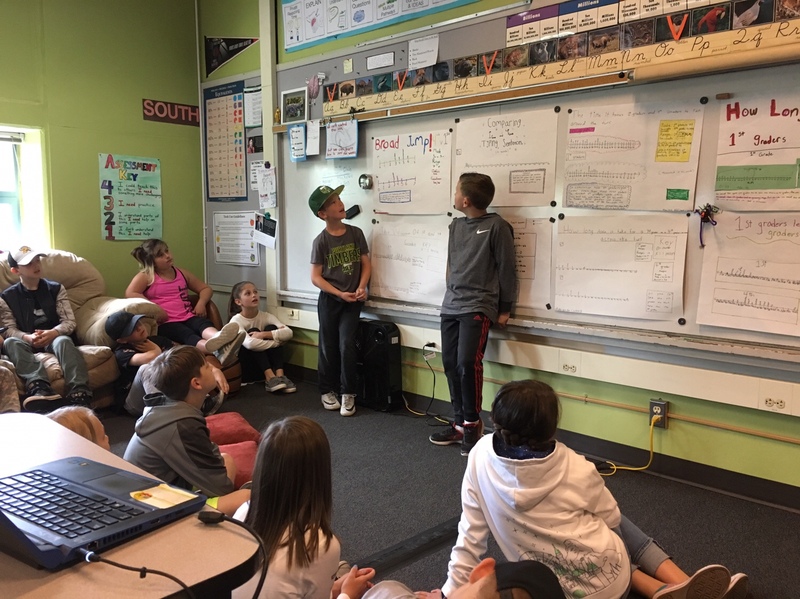 We also learned about the many options for improving traffic as well as the pros and cons of each idea. 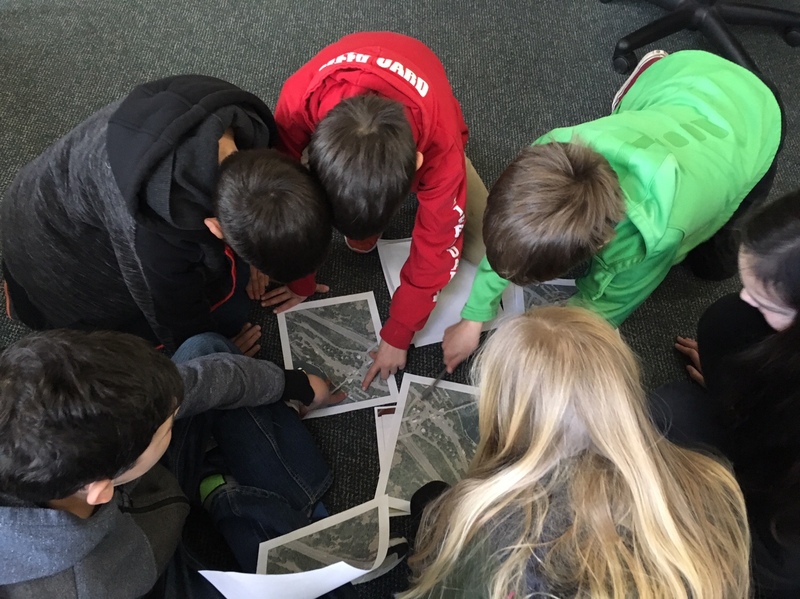 Lastly, students got together and brainstormed ideas for what they would like to see in the area. 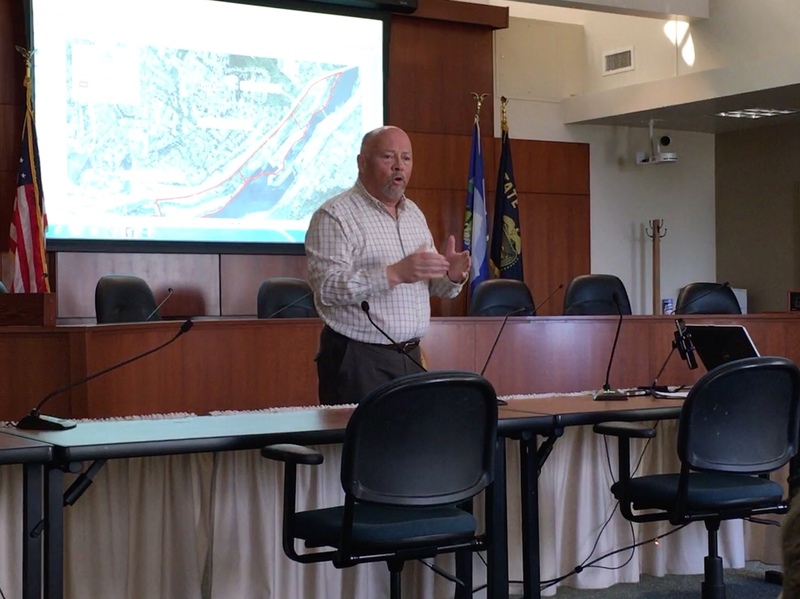 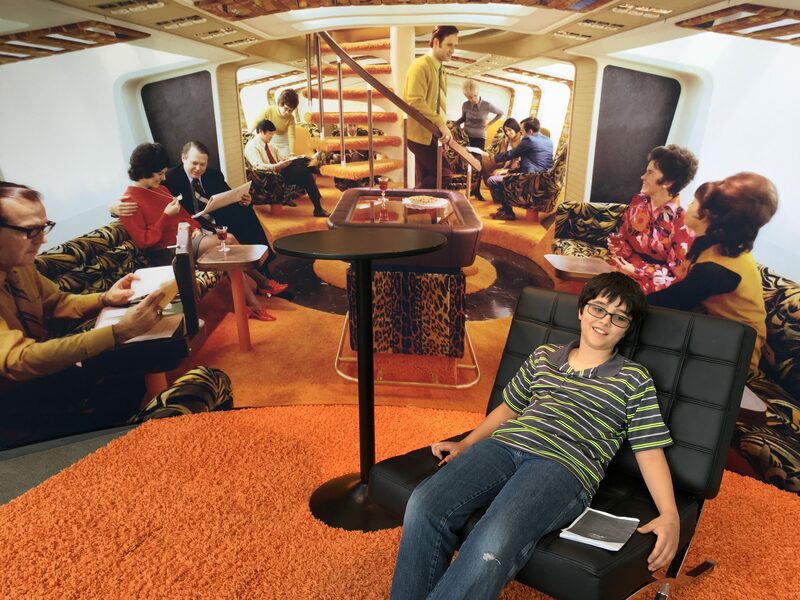 The long list of ideas included a dog park, an aquarium, a space for food carts, a gym, a hotel, and a boardwalk. 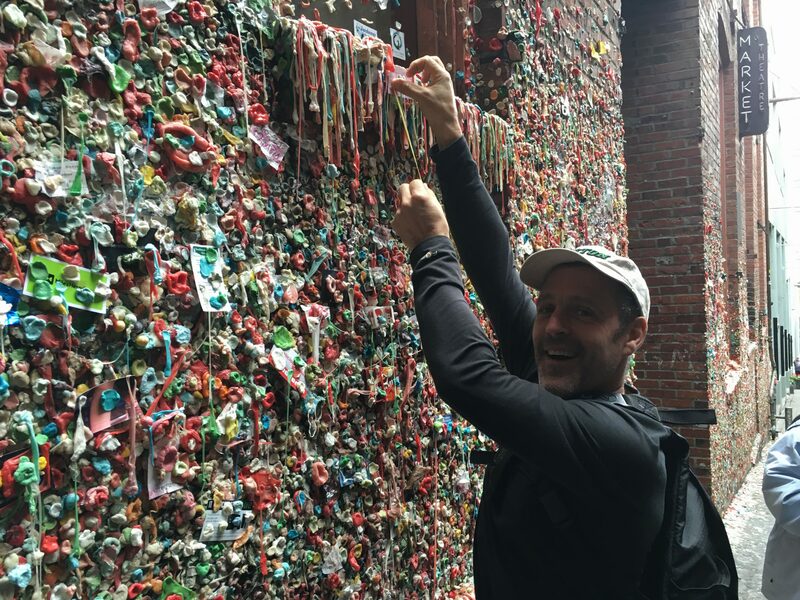 Mr. Morgan plans on sharing this list with City Council members soon. 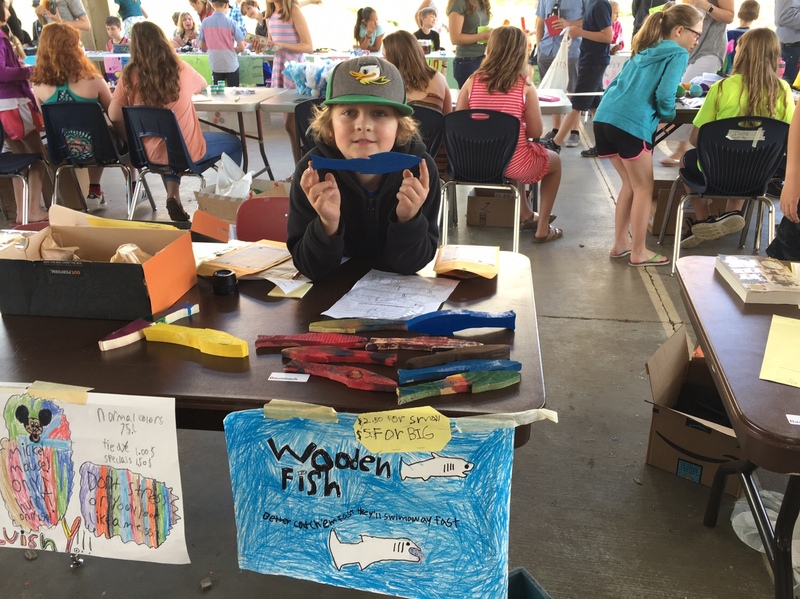 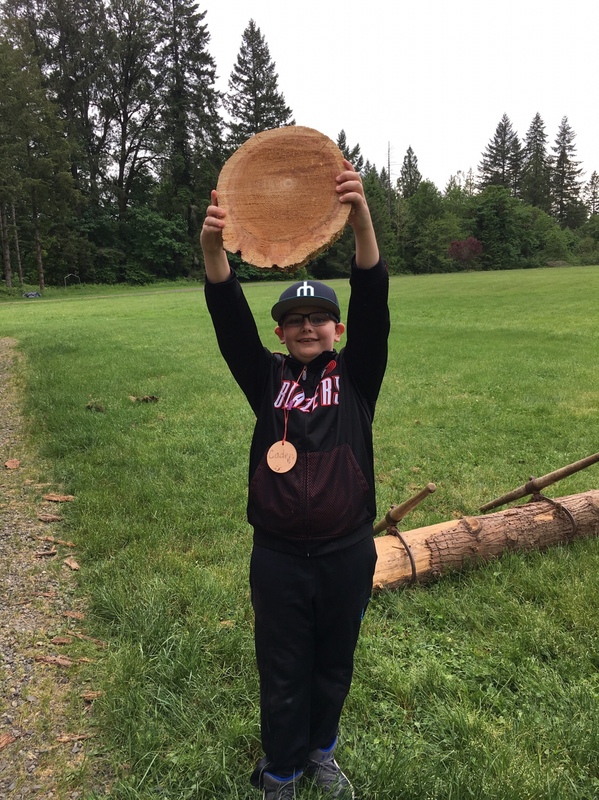 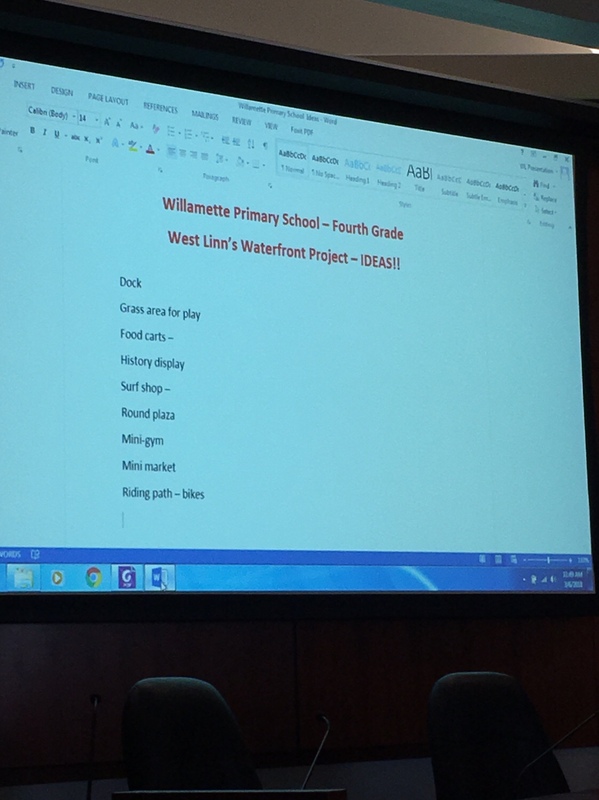 Who knows, maybe a Willamette fourth grader will be responsible for one of the features in the waterfront development.